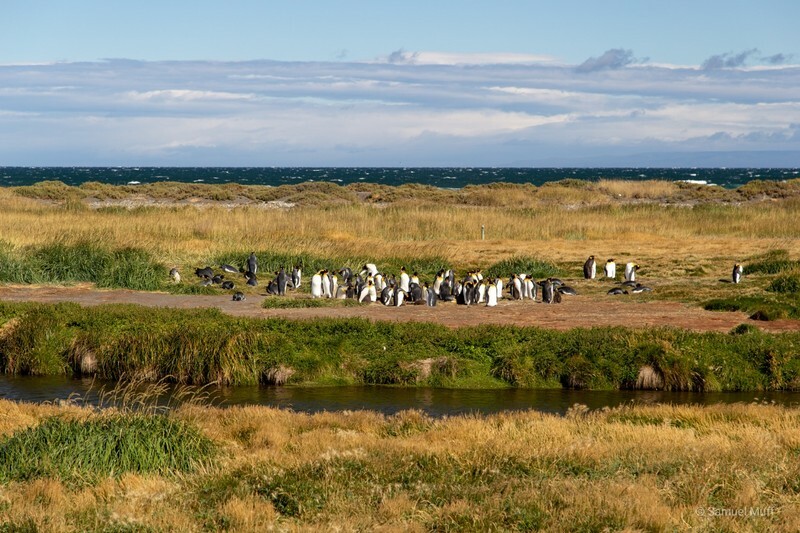 We spent two nights in Punta Arenas, the largest city in the South of Chile. 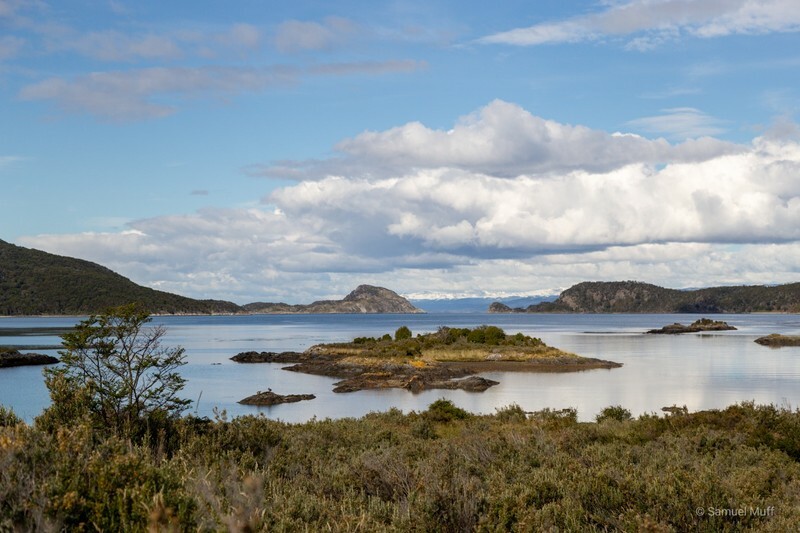 The day after arriving from Tierra del Fuego, we went straight back out into the Strait of Magellan on a tour to Isla Magdalena. 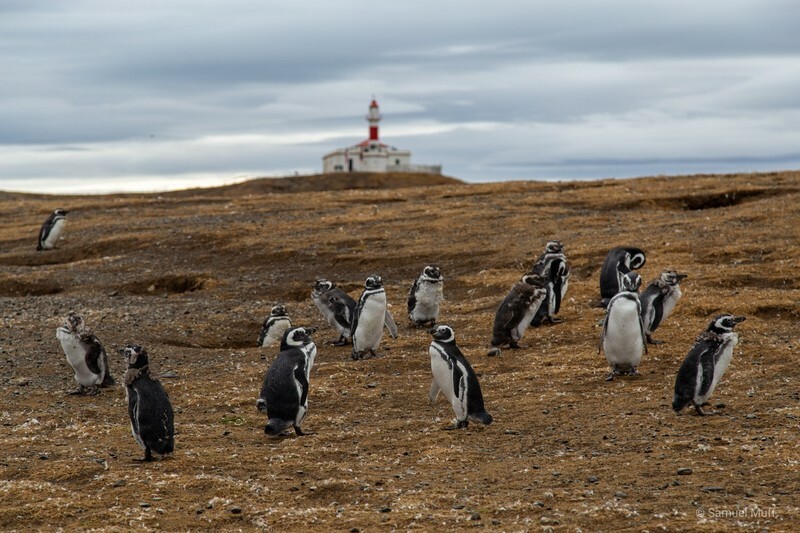 The uninhabited island is a protected nature reserve, nesting ground for countless birds and home to around 100’000 Magellanic penguins. Of course the penguins is what we came for. 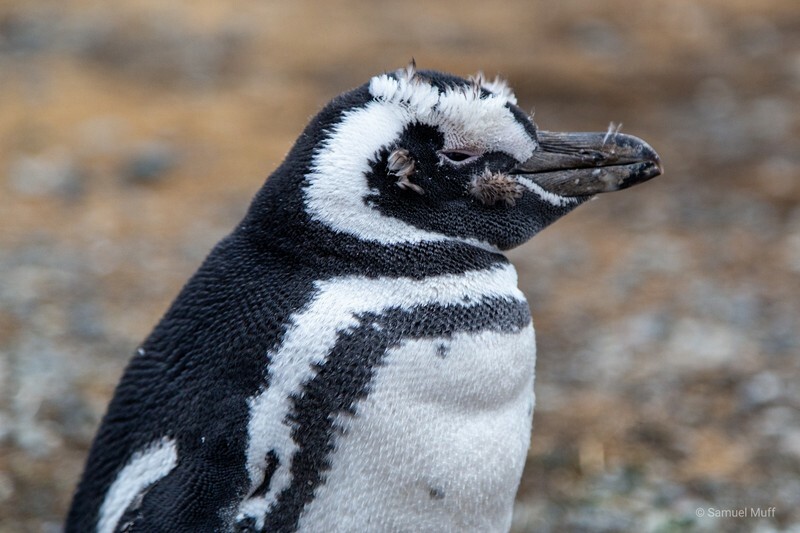 What made this visit stand out from our other penguin sightings is that we could walk among the penguins here and get within arms length of the small creatures. 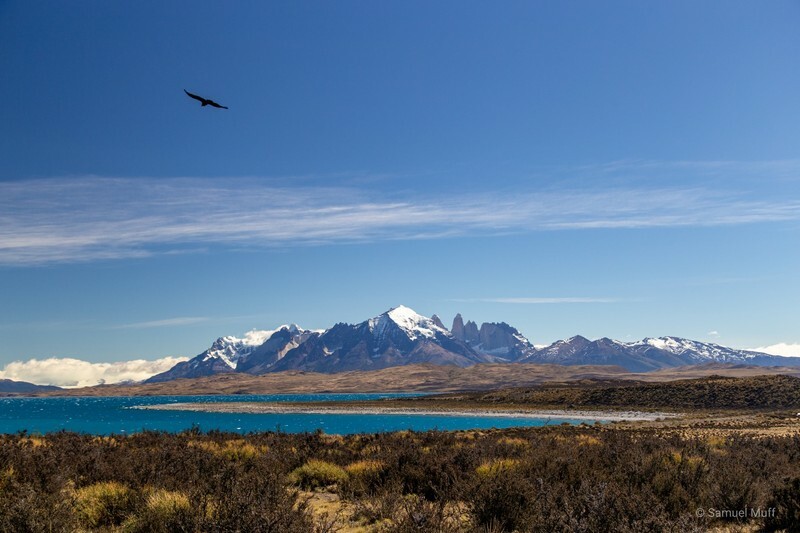 From Punta Arenas, we drove North to one of South Americas most famous national parks, Parque Nacional Torres del Paine. 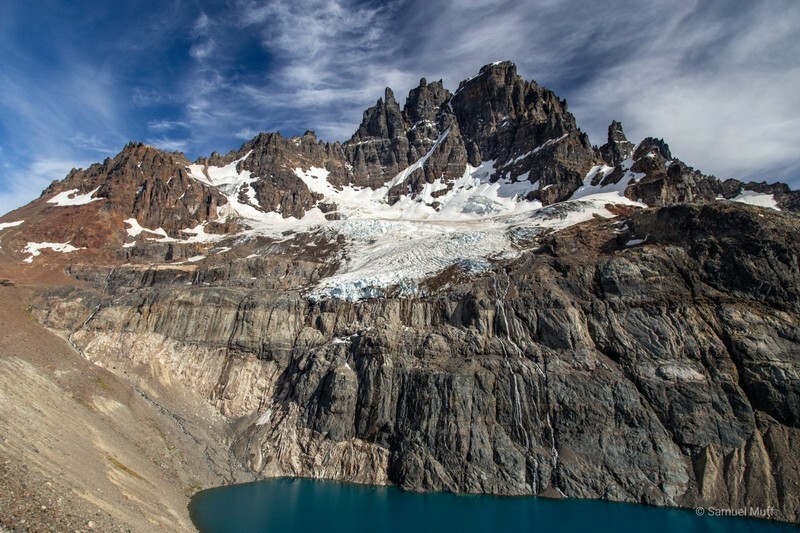 Since the weather forecast showed great weather for the next morning, we chose to start hiking already in the afternoon and spend the night at Refugio Chileno on the way to the Torres del Paine peaks. 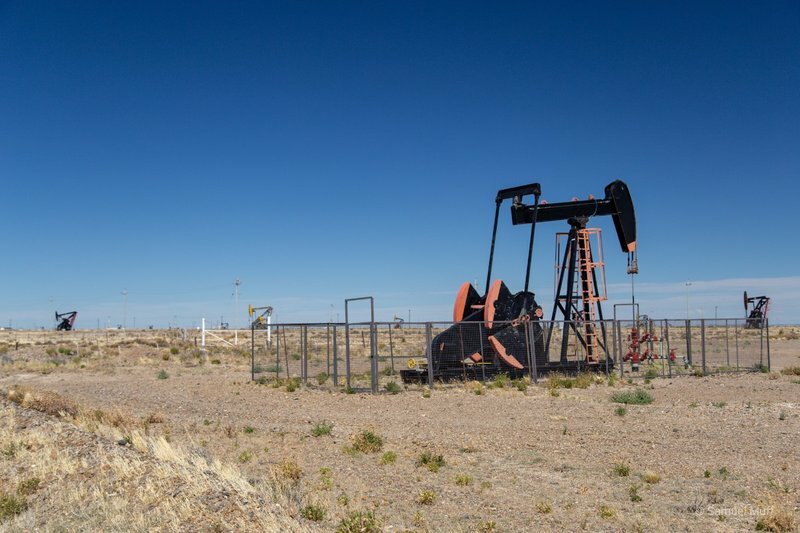 Reserving accommodations in this national park is a difficult process and often has to be done months in advance. Luckily, we managed to reserve a fully equipped 2-person tent for us just two days before going there. 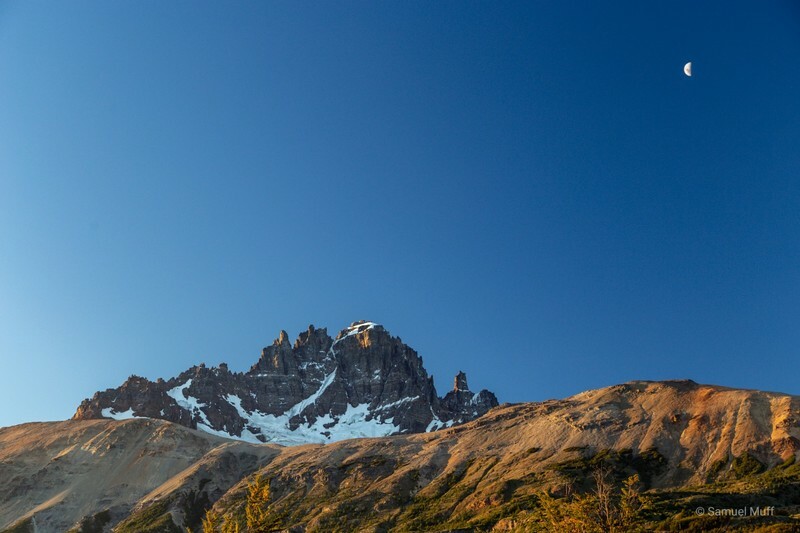 We started hiking at 6 in the morning, about one and a half hours before sunrise, hoping to arrive to the Torres del Paine peaks before the crowds. However, as we got closer to our destination, lots of hikers were already coming back down. It seems we had underestimated the other hikers and many actually went even earlier to watch the sunrise from the top. Ironically, when we arrived there about 45 minutes after sunrise, we were almost alone. We had found the sweet spot between the crowds who went there for sunrise and the crowds who took it slow and enjoyed breakfast before starting the day. 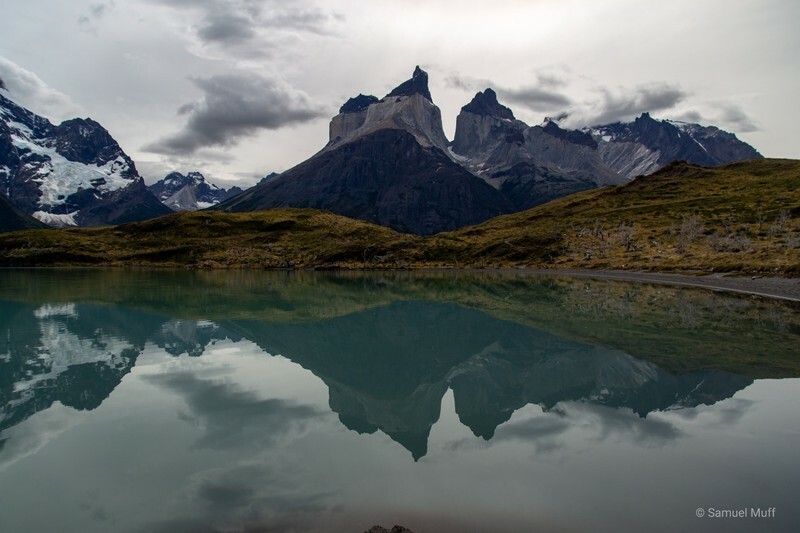 We spent around half an hour at the top, savoring the almost surreal view of the three granite peaks and the perfect mirror surface of Lago Torres. 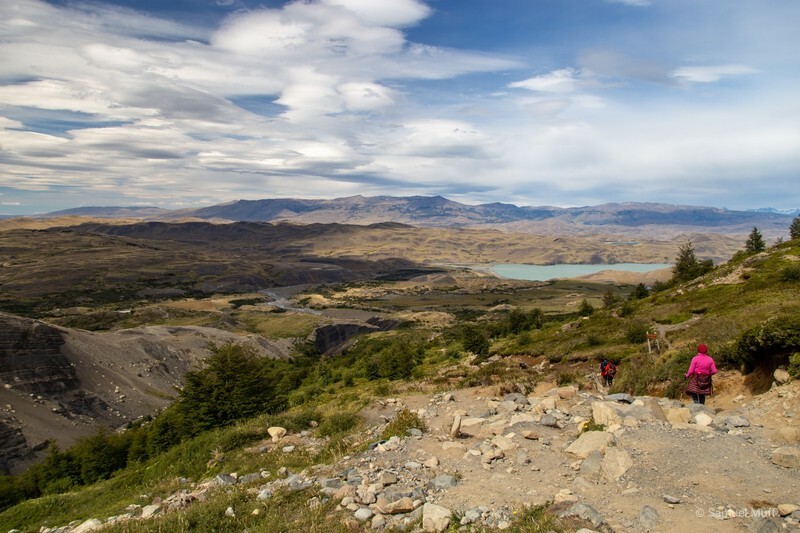 Since accommodations in and near the park are extremely expensive, we drove two hours to Puerto Natales to spend the night after returning from our long hike. The next morning we returned for a third day in the national park. The first half of the day we spent hiking to a lookout for another iconic mountain view. 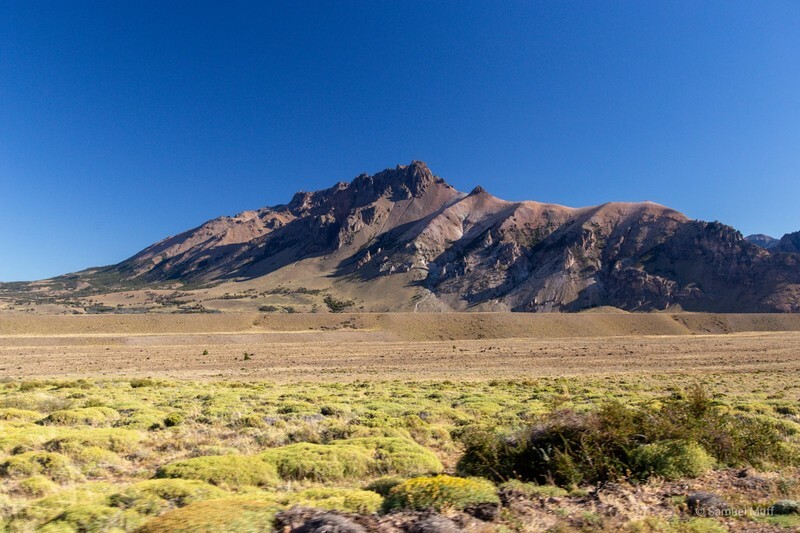 Los Cuernos are a group of mountains that show three very distinctly colored layers. The second half of the day we did a boat tour on Lago Grey to the Grey Glacier. 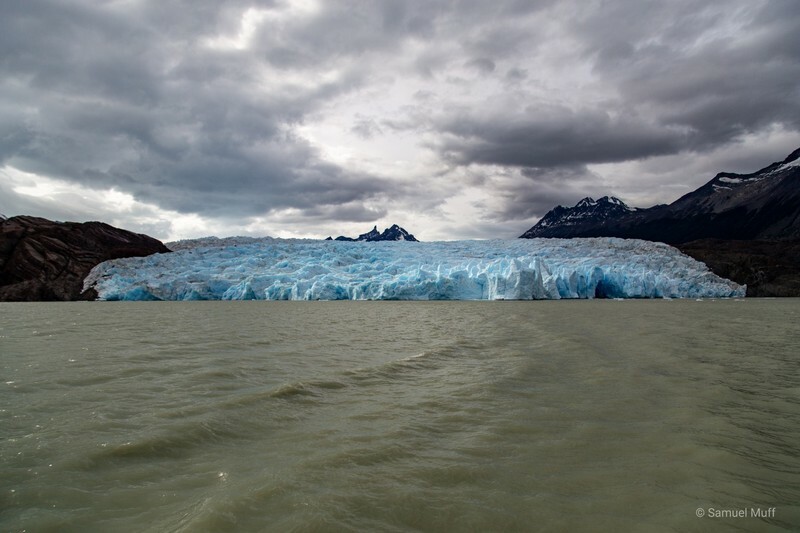 Many icebergs that have fallen off the glacier could be seen on the way there. 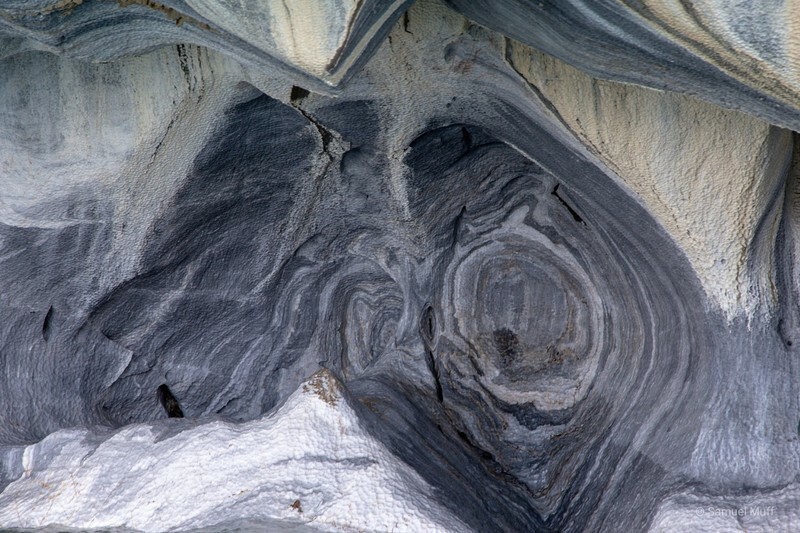 The huge mass of ice is an impressive sight from close up. 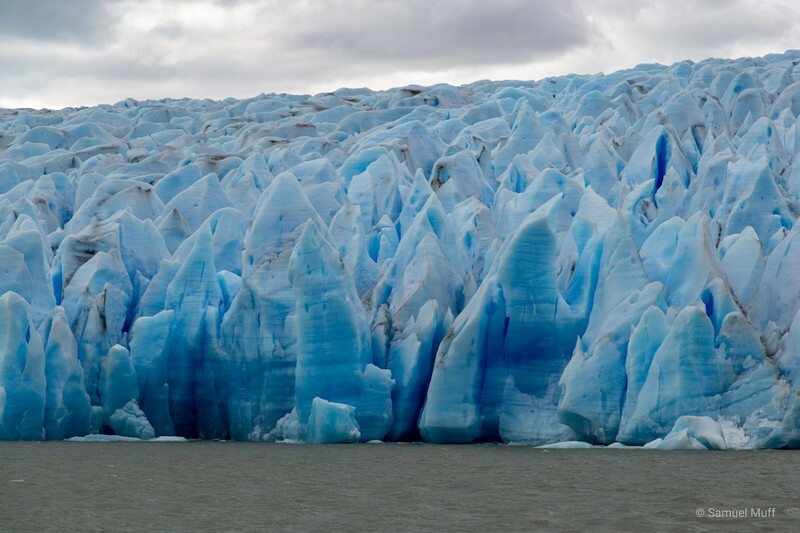 The glacier is almost 30 meters tall where it meets the lake and it has a deep blue hue. 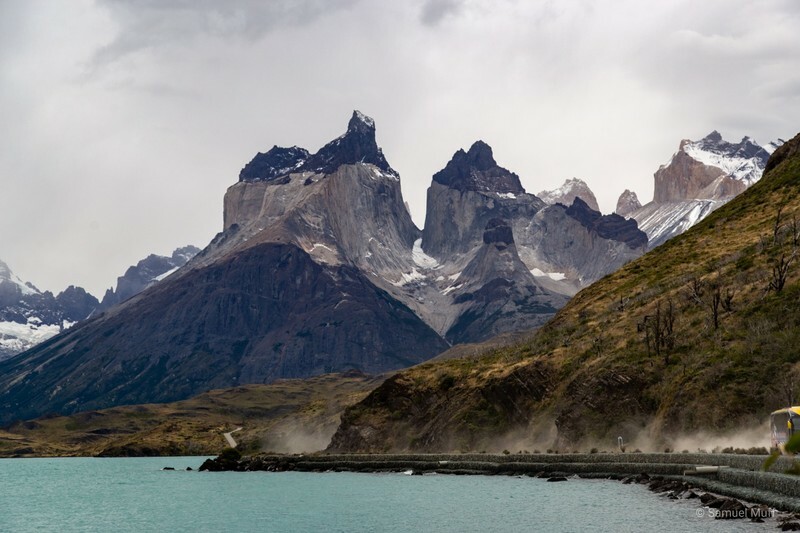 There are no roads in Chile that connect the North and the South of Patagonia, since the area in between consists mainly of large fjords and glaciers. 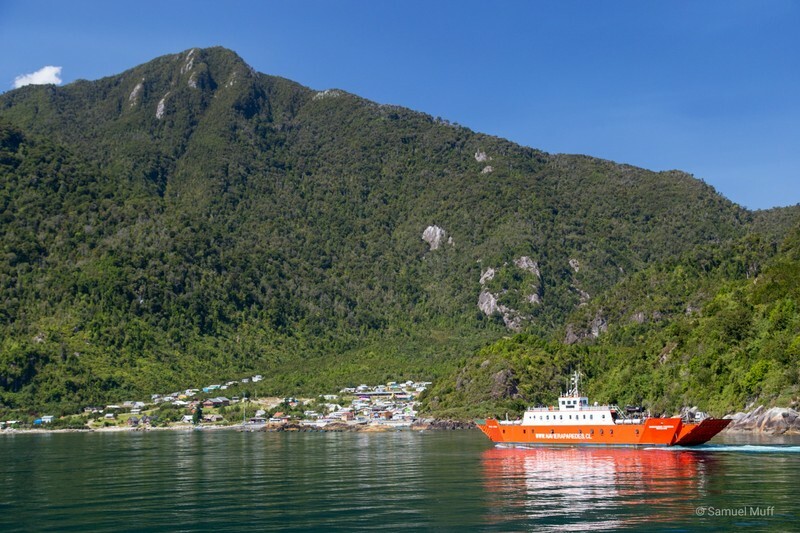 The only connection is by ferries from Puerto Natales that take three to four days and you need to book it months in advance. 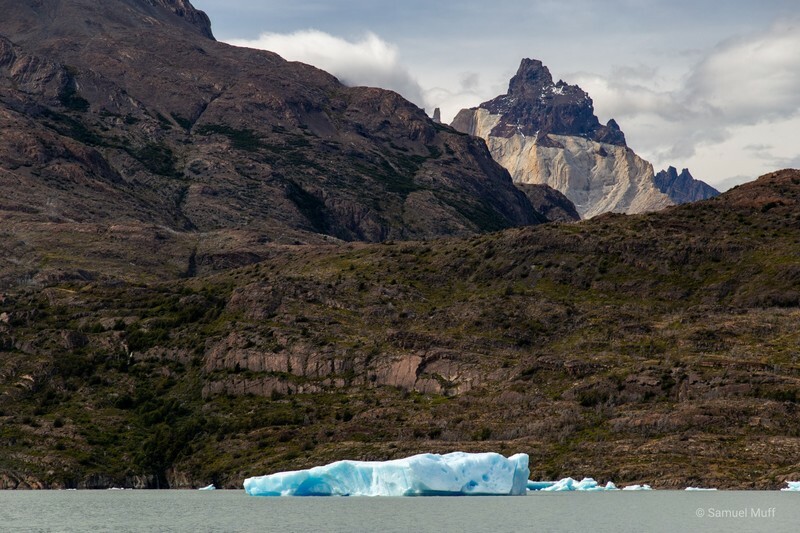 For us, it was time to return to Argentina, where the area east of Parque Nacional Torres del Paine offers plenty to see too. 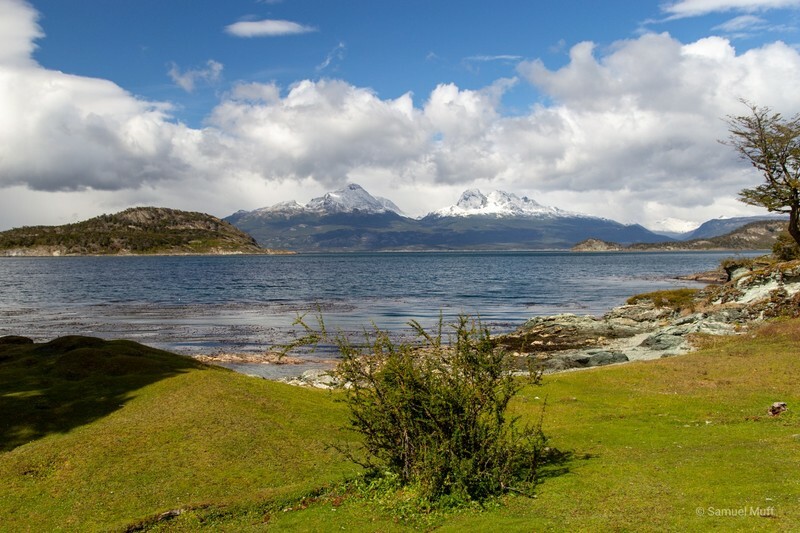 Tierra del Fuego is separated from the South American continent by the Strait of Magellan. At its narrowest point, the strait is less than 5 kilometers wide, which is where we took the car ferry. The crossing takes only 20 minutes and the ferry is supposed to go every half hour. However, when we got there one of the two ships was out of service, which created a long backlog of waiting cars. After waiting in line for four hours and after the sun had already set, we finally made it to the other side. 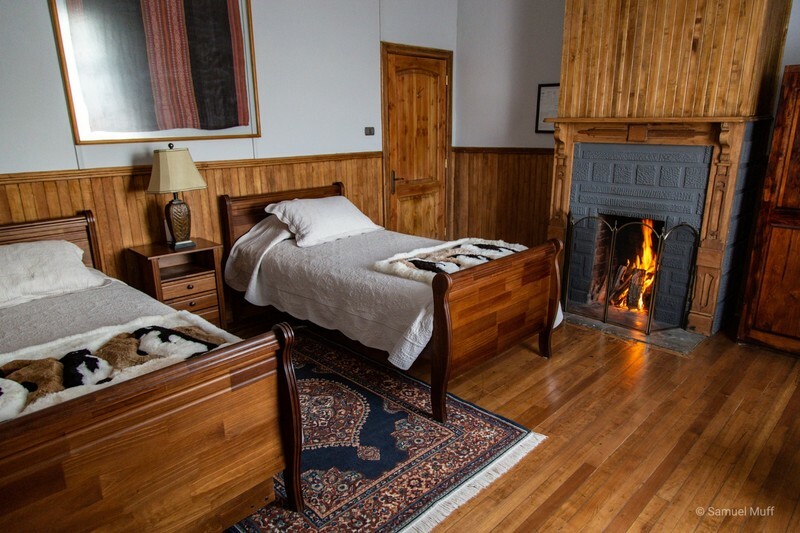 We managed to find a guesthouse in the Chilean town of Cerro Sombrero to spend the night. 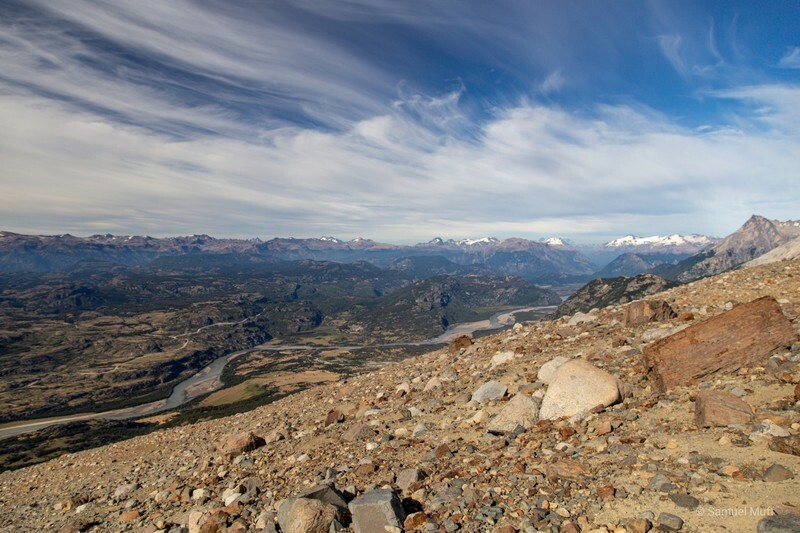 The Chilean-Argentine border roughly cuts Tierra del Fuego in half, though Chile controls the entire Strait of Magellan, which leaves the Argentine part disconnected from the rest of Argentina. 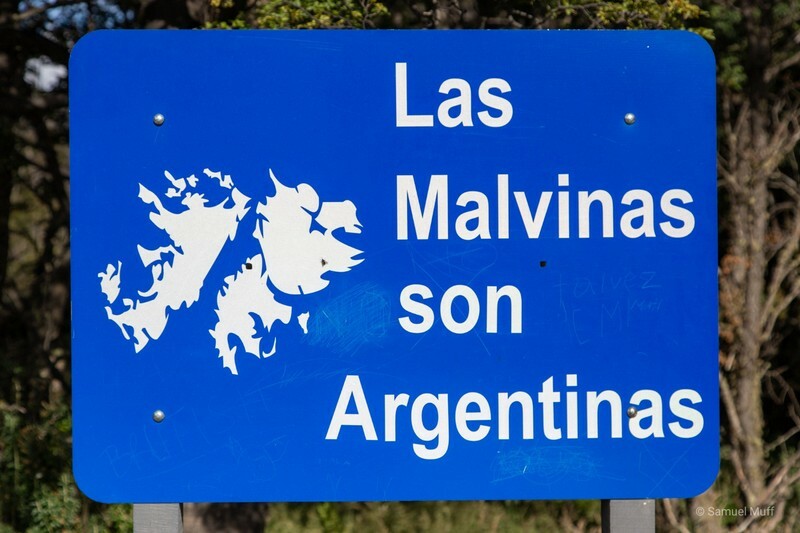 Therefore, we had to cross two borders in two days on the way to Ushuaia. 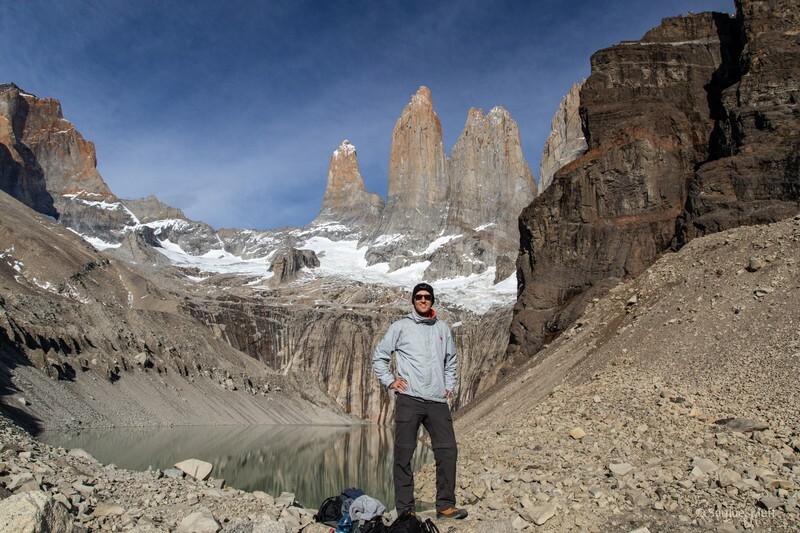 We spent one night in the Argentine city Rio Grande, which was not necessary in retrospect. 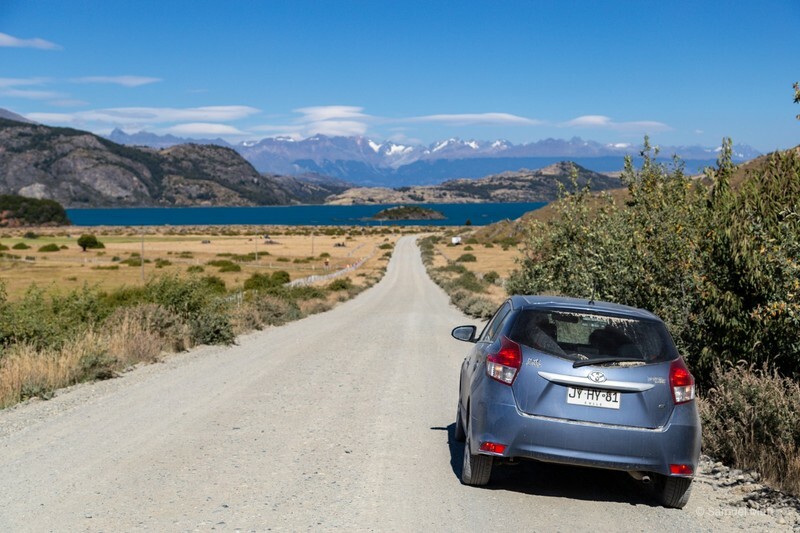 The roads in Tierra del Fuego were much better than we expected and we could have driven down to Ushuaia in a single day. 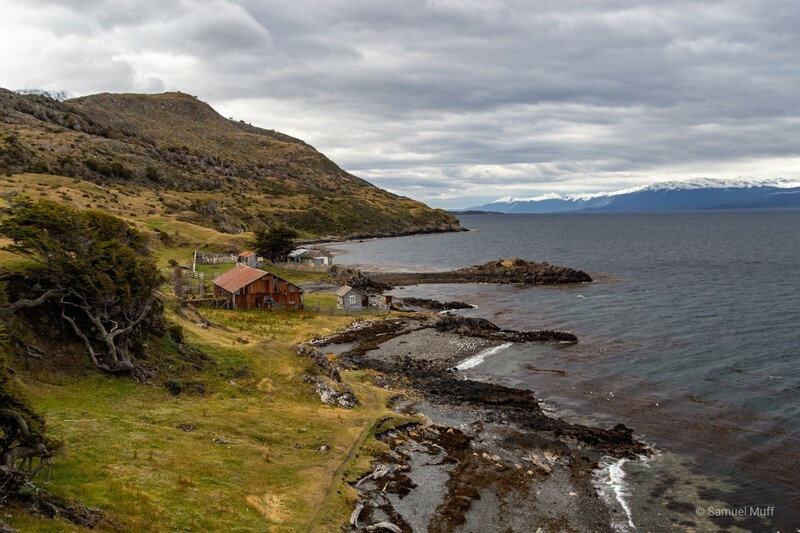 When Ferdinand Magellan first sailed here, he saw many fires across the land, which is why he named it Tierra del Fuego (Land of Fire). The native Yaghan people lived in this cold climate with little to no clothing. Instead, they kept warm by making fires. On the day we drove to Ushuaia, the world’s southernmost city, we did not feel the fire. It was very cold and windy. As we drove over the mountain passes before the town, we were hit with heavy gusts of snow and rain. We spent the afternoon in our hotel, drinking tea, looking out the window and wondering what winter here might look like. Fortunately, the next day was much warmer and brighter. 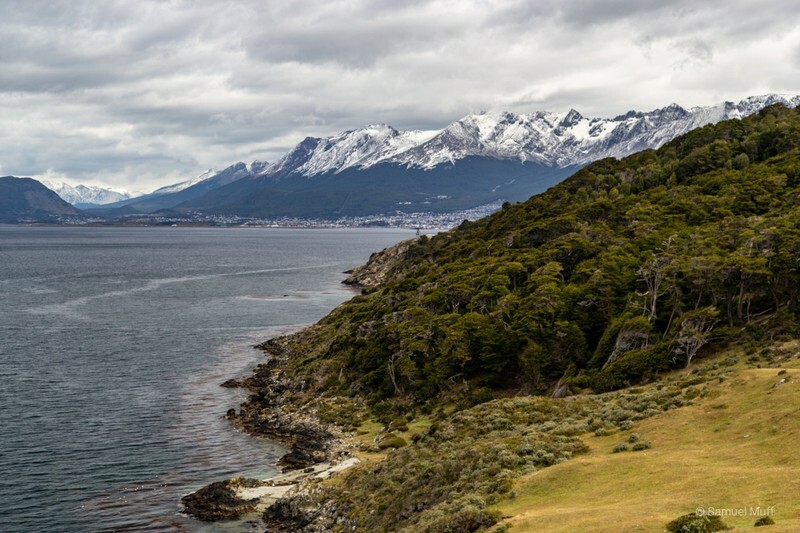 We spent the day in Parque Nacional Tierra del Fuego, which is located West of Ushuaia along the Beagle Channel. We did a few hikes around the park to experience the beautiful scenery. 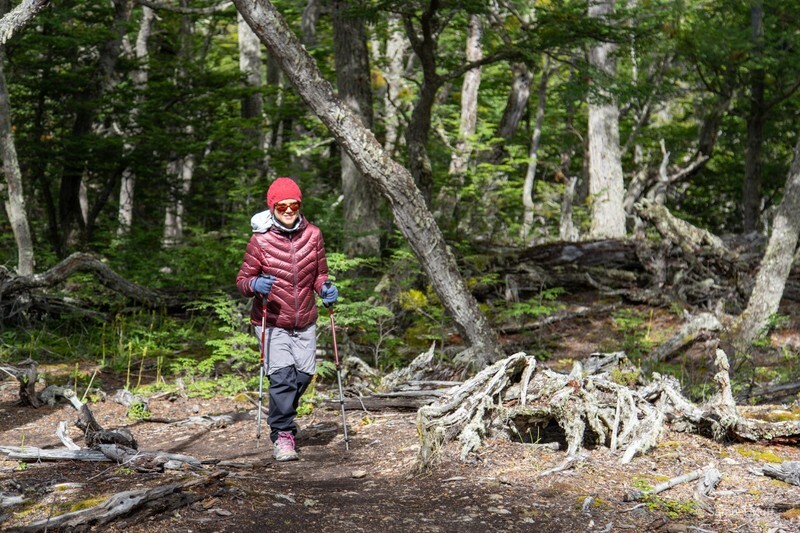 On the last day in Ushuaia, we hiked East of the city along the Beagle Channel to Estancia Túnel. While the national park is quite full of tourists, we were almost alone on this hike and could enjoy the sweeping views in the silence of nature. 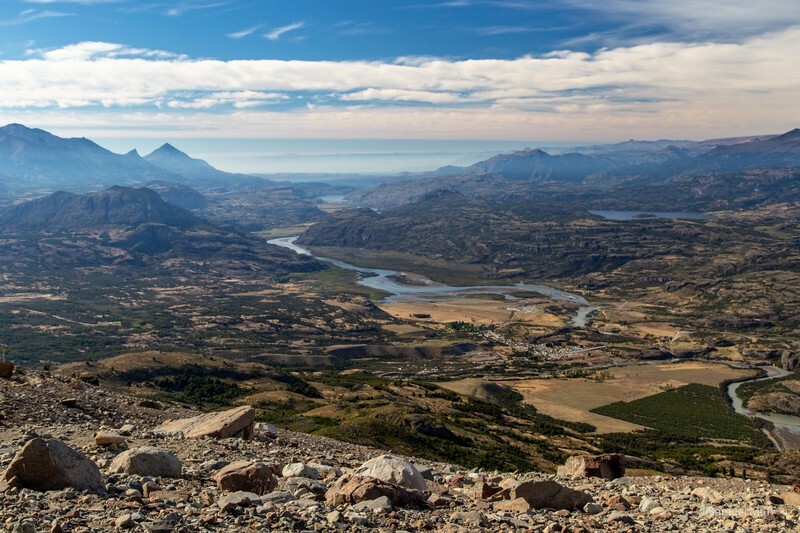 After three days in Ushuaia, it was time to turn around and start moving North again. In a bit more than three weeks, we will have to return our car in Santiago. 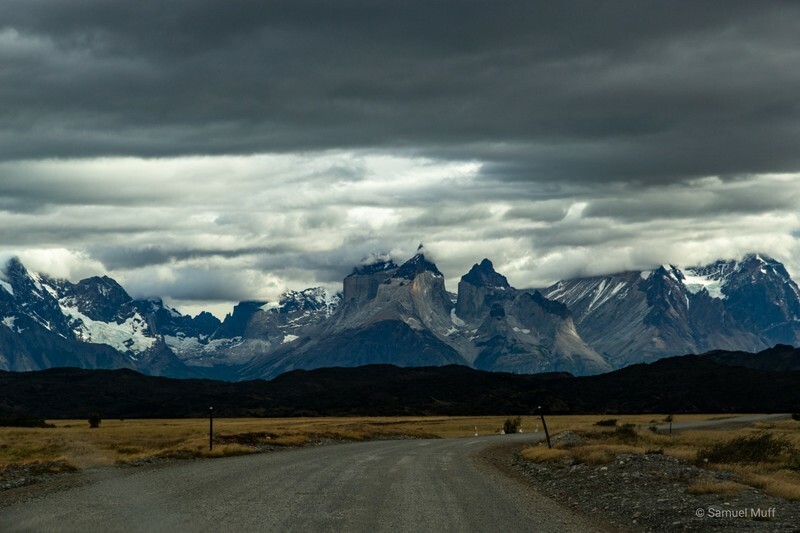 Since we knew that the roads were good, we covered more distance this time and drove all the way back to the Chilean part of Tierra del Fuego. 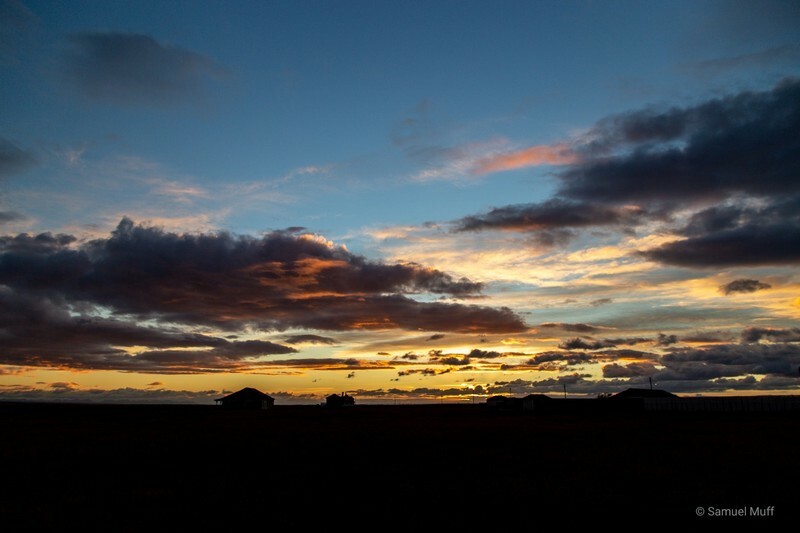 Back in Chile, we spent the night at a beautiful estancia in the middle of nowhere. It was a great spot for a couple on their honeymoon. 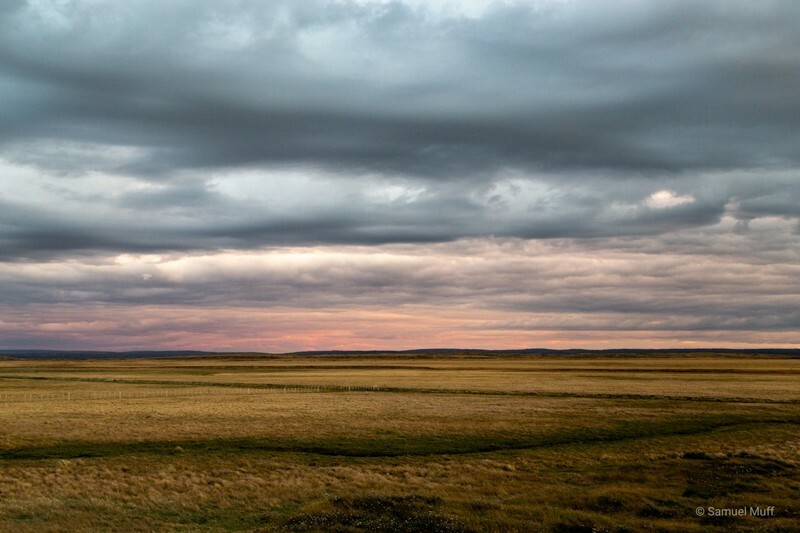 Our room had an open fireplace that kept us warm throughout the night and the sunset over the endless plains surrounding us was spectacular. 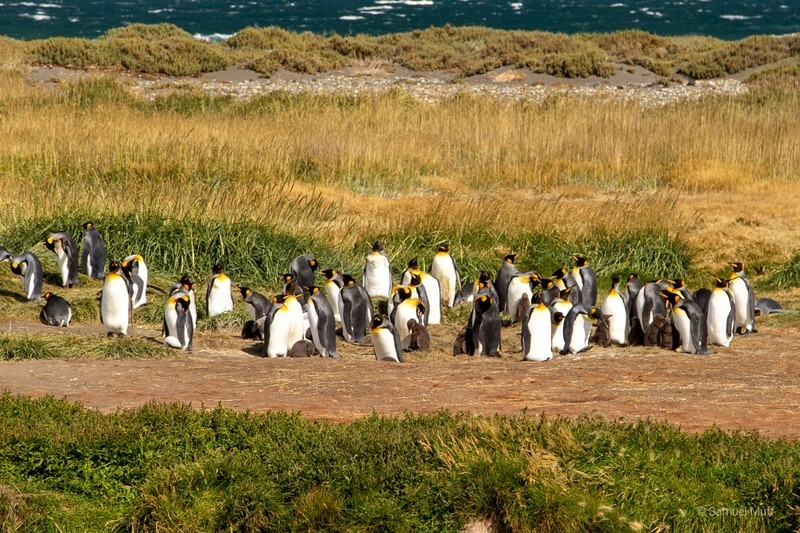 Another great thing about this estancia was its proximity to a king penguin colony. 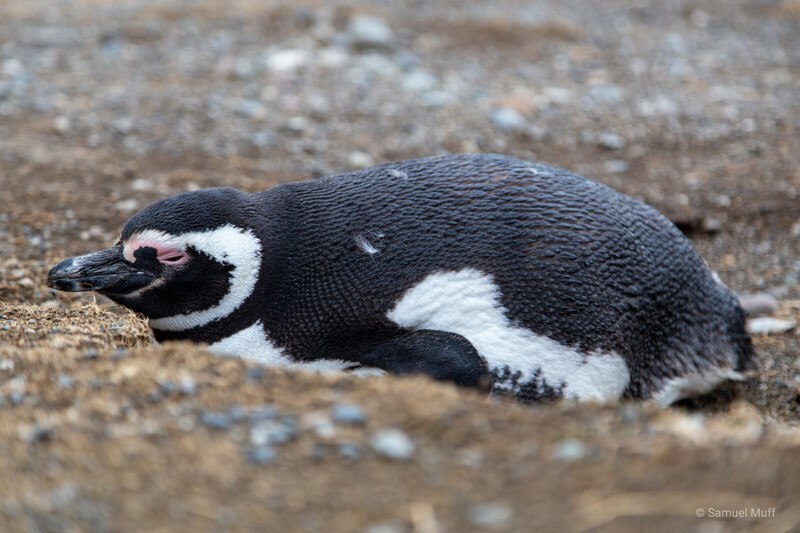 This is the second largest species of penguins in the world. 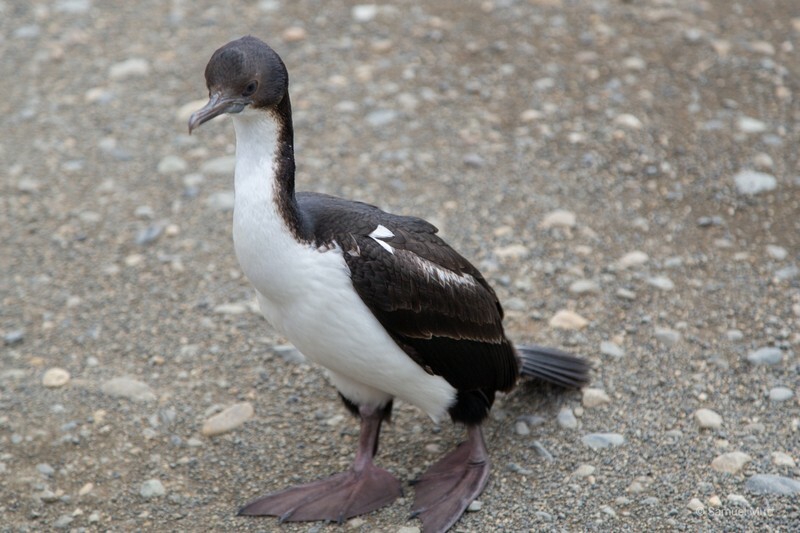 With a height of almost one meter, they are much taller than the Magellanic penguins we saw back in Chiloé. 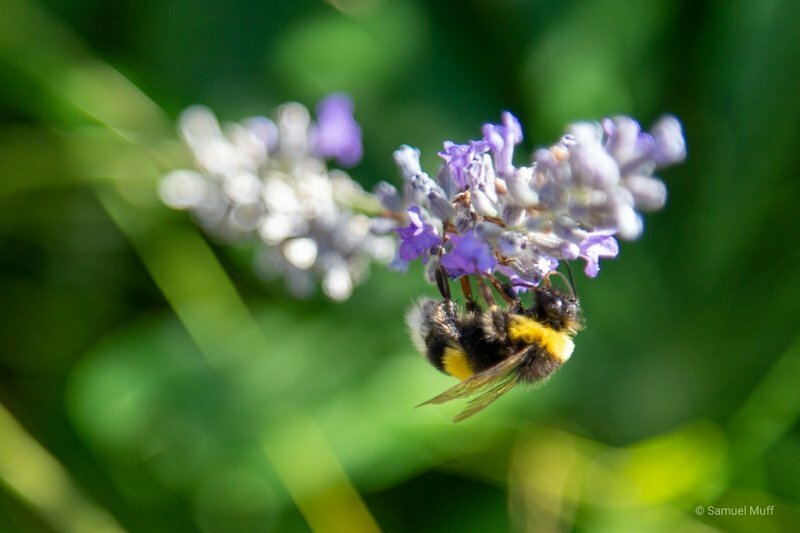 Besides the height, they also differ in the yellow-orange color on their heads and chests. 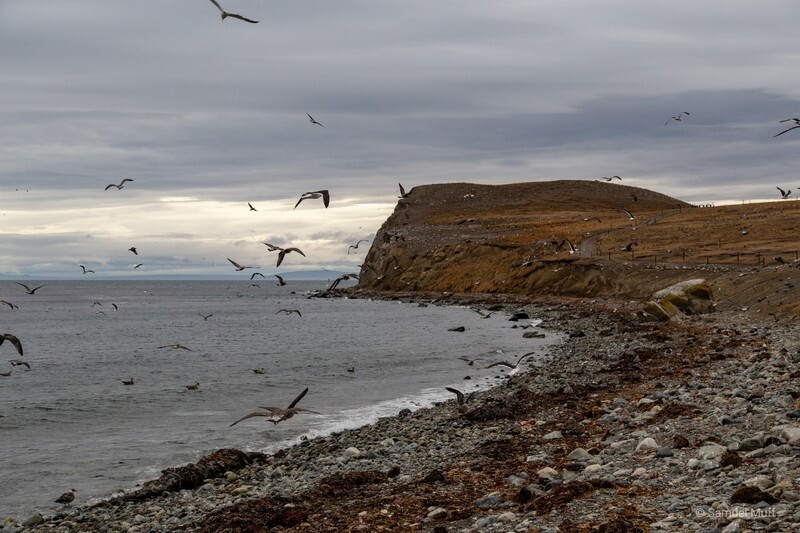 From the penguin colony, 110 kilometers of gravel roads brought us to Porvenir, a small town at the Western edge of Tierra del Fuego. 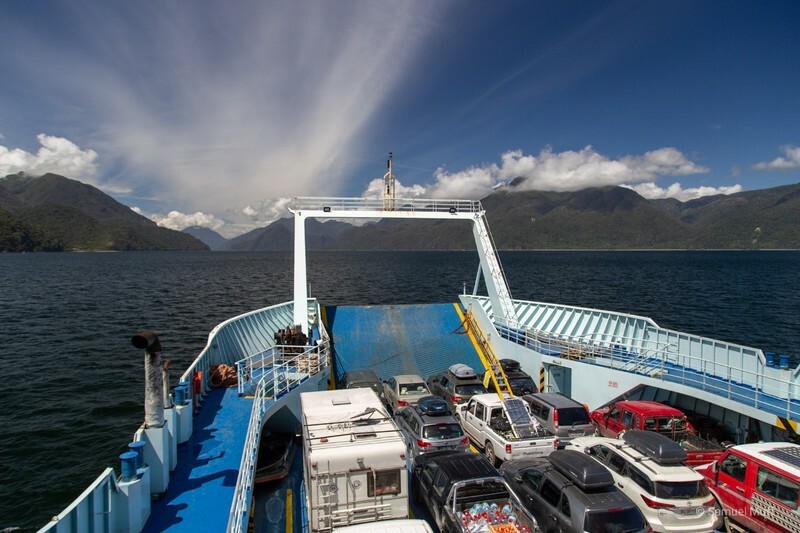 From there, we left Tierra del Fuego by taking the car ferry back to the South American mainland. The sea was rough on the nearly 40 kilometer crossing to Punta Arenas and we were happy when the ride was over. Our first international border crossing in South America was a quick and efficient process. On the Chilean side, we had to get our passports and the customs documents of our rental car stamped for exiting the country. After that, we could drive the bridge over Río Jeinimeni, which marks the border between the two countries at that point. On the Argentinian side, the same process repeated with entry stamps in the passports and our rental car documents. Overall, the entire process did not take more than 15 minutes and there were no significant lines on either side. The town across from Chile Chico was called Los Antiguos and we immediately felt that we had arrived in a different country, despite the two places being separated by only 10 kilometers. Restaurants were all of a sudden half the price, served much better food and were served by waiters who were dressed up and friendly. Argentina is known for its great beef, so for our first meal we ordered a big steak which was grilled to juicy perfection. For the first time in weeks, we stayed at a proper hotel, for the same money that would have afforded us a simple guesthouse back in Chile. 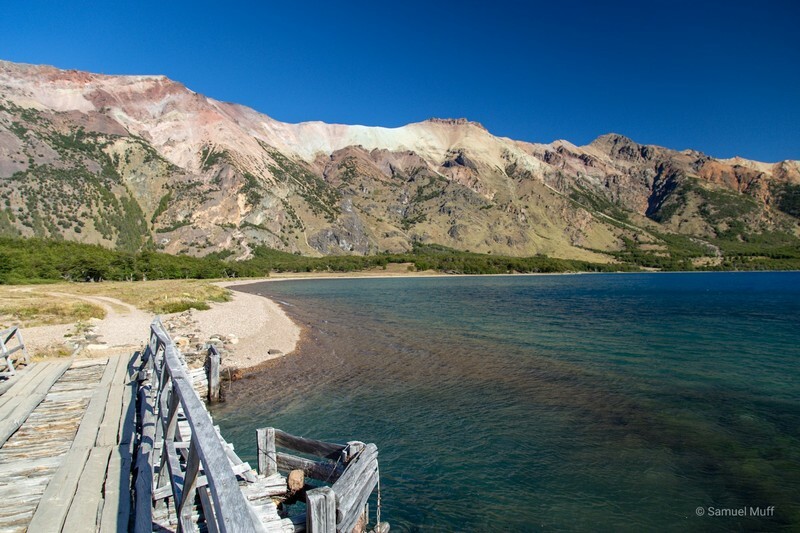 The hotel was located directly at Lago General Carrera, which was known by the name Lago Buenos Aires in Argentina. Also the landscape changed surprisingly fast. 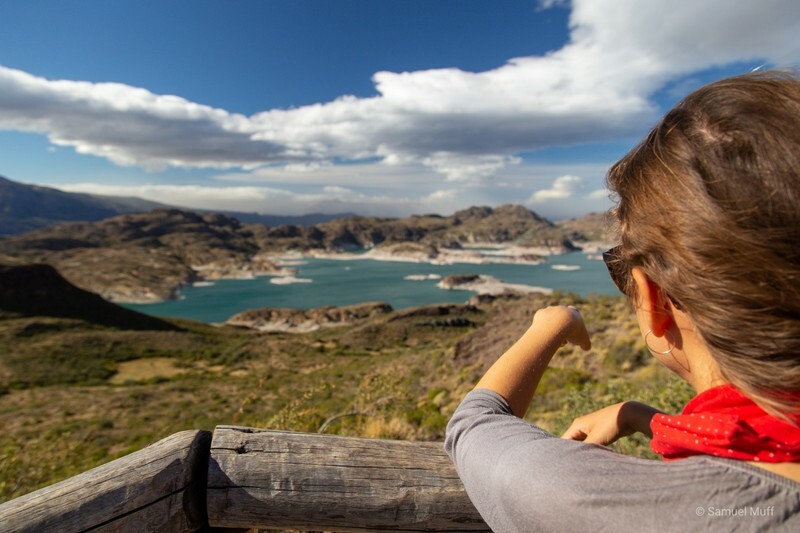 After driving only one hour from Los Antiguos, we had lost sight of any mountains, forests, lakes or rivers and were suddenly surrounded by endless plains of nothingness, basically a desert. The next three days we were driving a lot, covering huge distances, helped by the fact that all the highways were properly paved and there was basically nothing to do or see along the way. On the first day, we drove East across the continent to the Atlantic Coast on highways drawn with a straight edge through the country. Whereas the landscape was totally boring, we started seeing lots of interesting animals along the way. 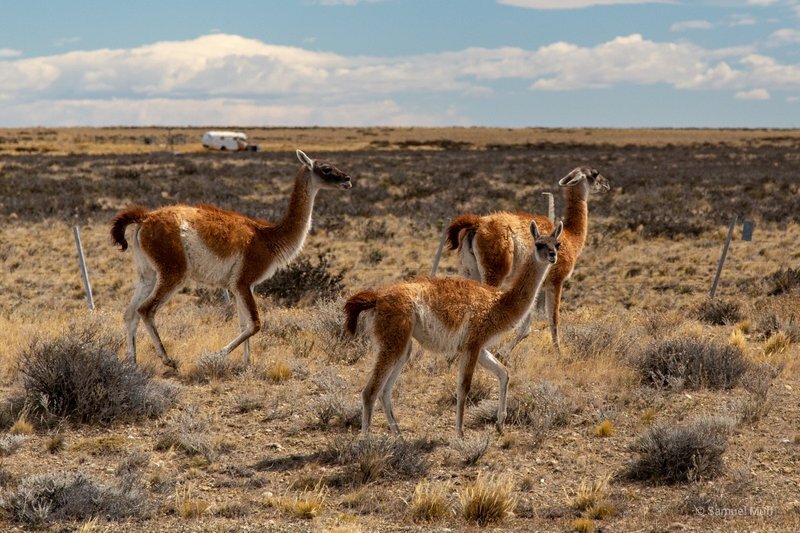 The first one was the guanaco. 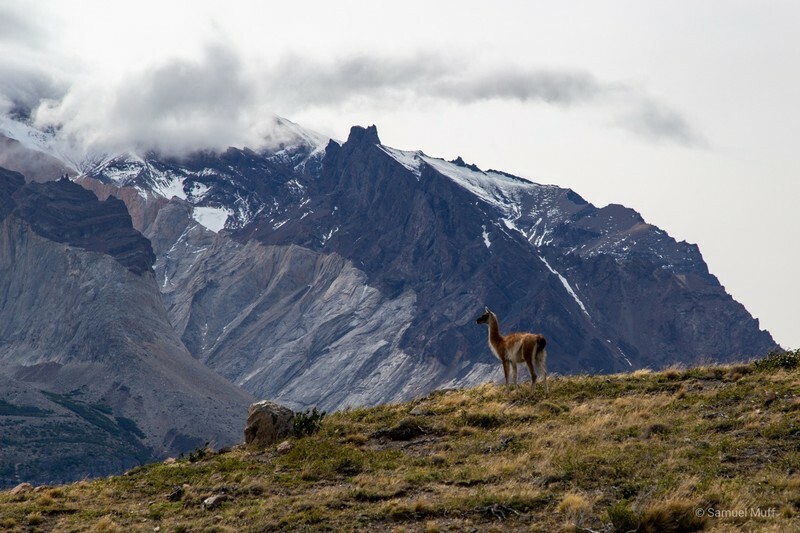 Guanacos are related to camels, though they lack the humps. 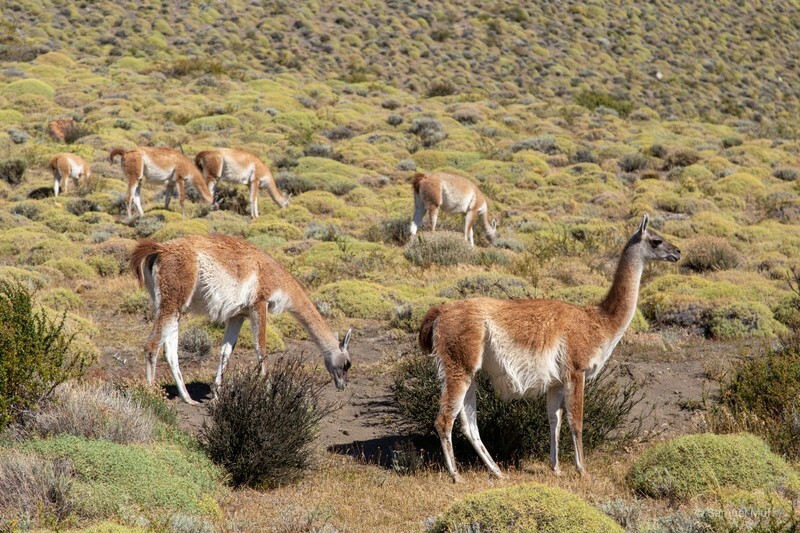 They are also related to lamas, but are less hairy. We saw hundreds, if not thousands of them grazing along the highway. They can run very fast and Sam had to be very alert when they were close to the street, as they sometimes run across. 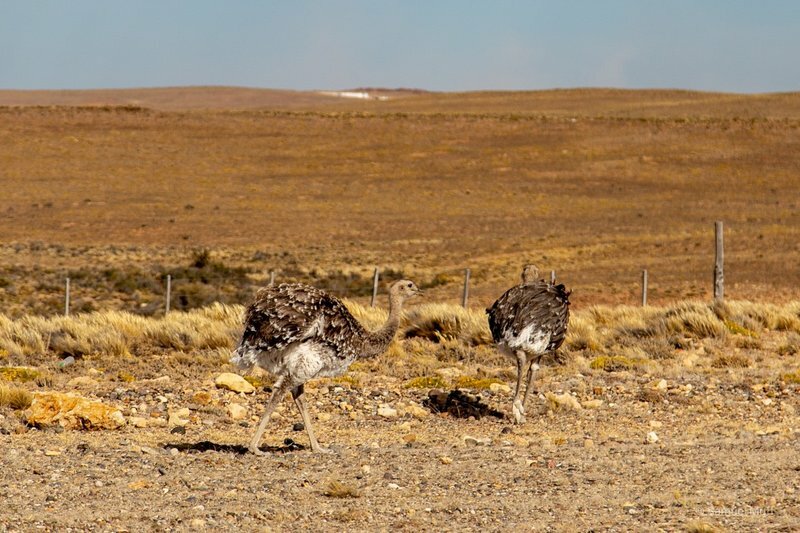 A second animal native to South America is the nandu. 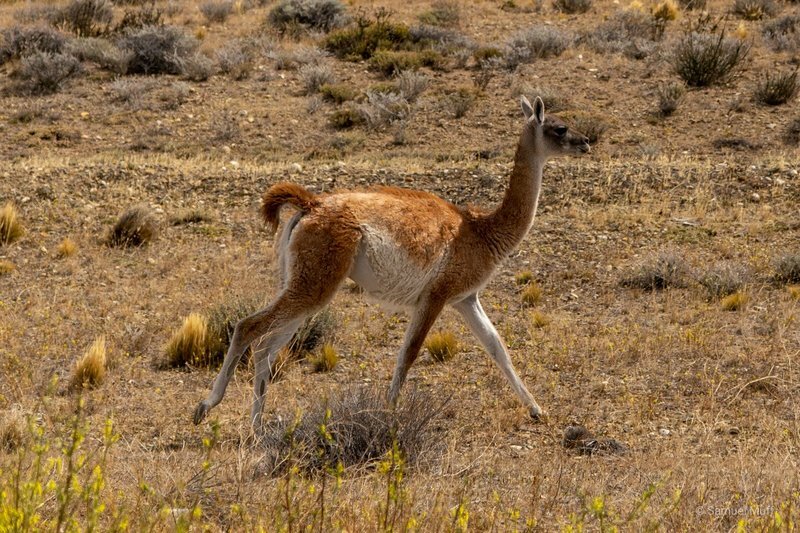 They were rarer than the guanacos but we still saw plenty of them. 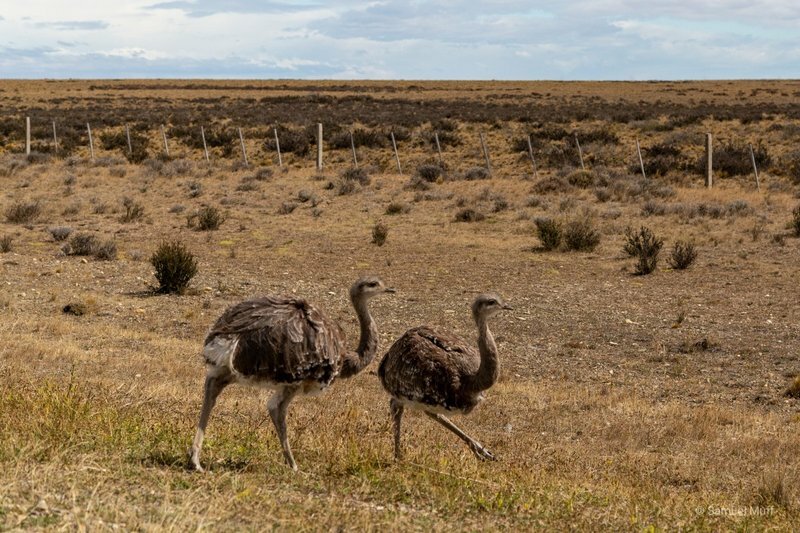 Nandus are large flightless birds, similar to ostriches or emus. They are also surprisingly fast runners. They can even run as fast as 50 km/h. We also saw some grey foxes and one armadillo crossing the highway. After driving 640 kilometers the first day, we spent one night in Puerto San Julián at the Atlantic Coast. The next night we spent at an estancia near Parque Nacional Monte León. 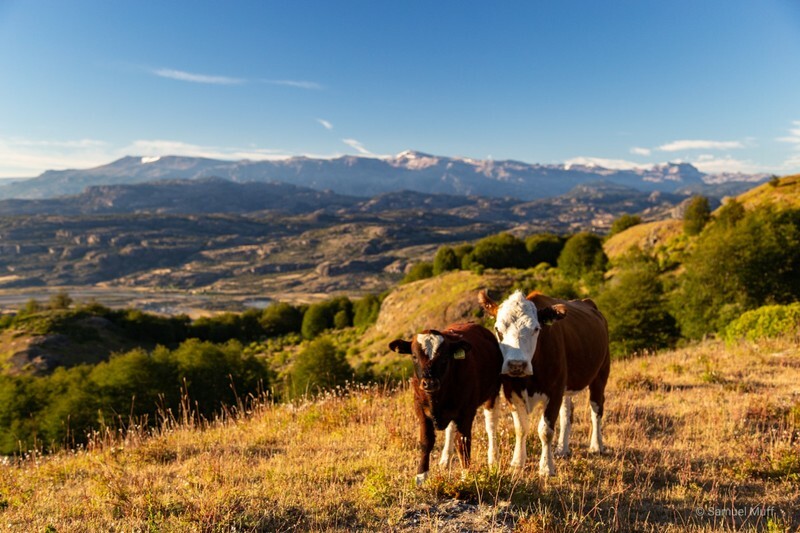 Estancias are basically ranches that manage a huge area of land. 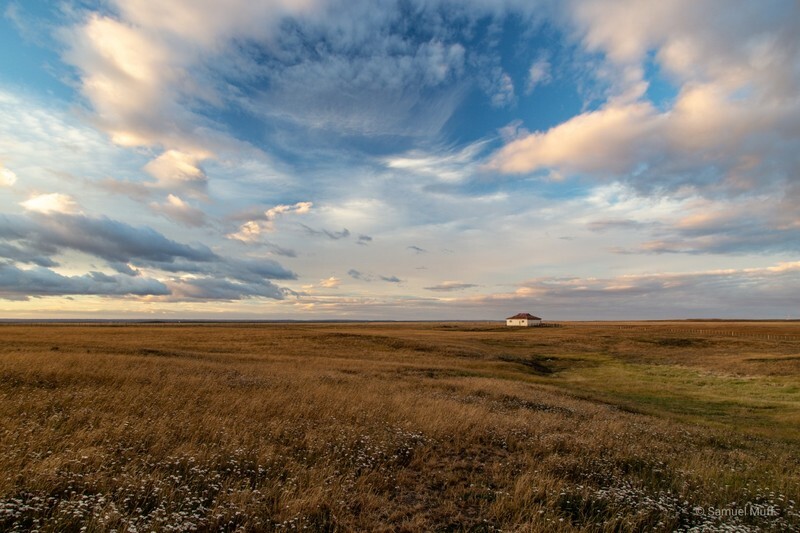 They used to farm cattle, but many are now moving to tourism and offer accommodations in a quiet and remote setting. 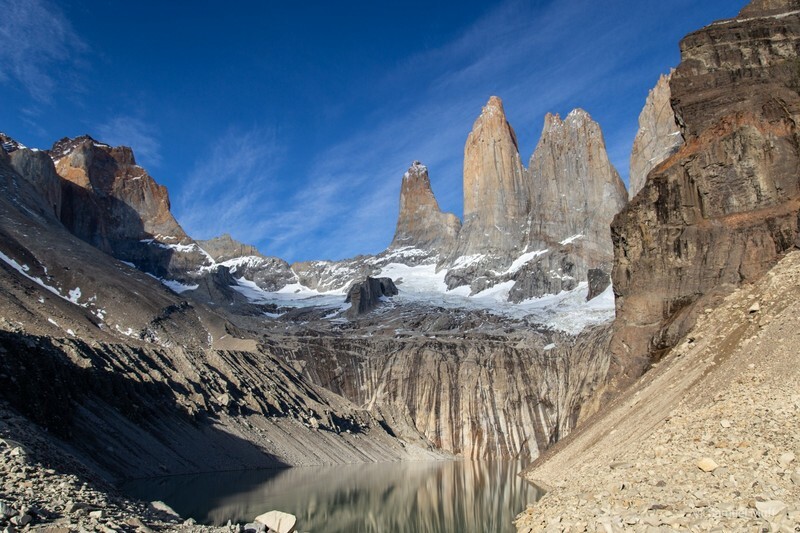 After three days in Argentina, we already had to go back to Chile. 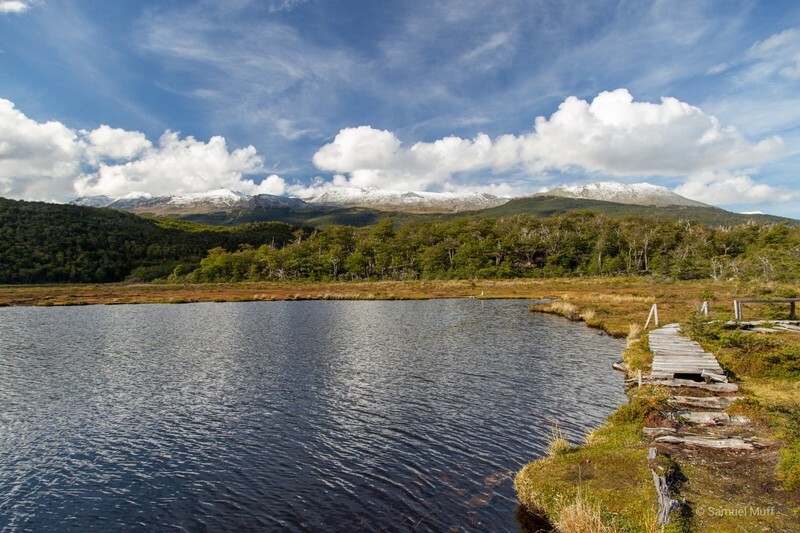 The Argentine part of Tierra del Fuego where we were heading is completely surrounded by Chilean territory, so it is not possible to access it by car without crossing Chile first. 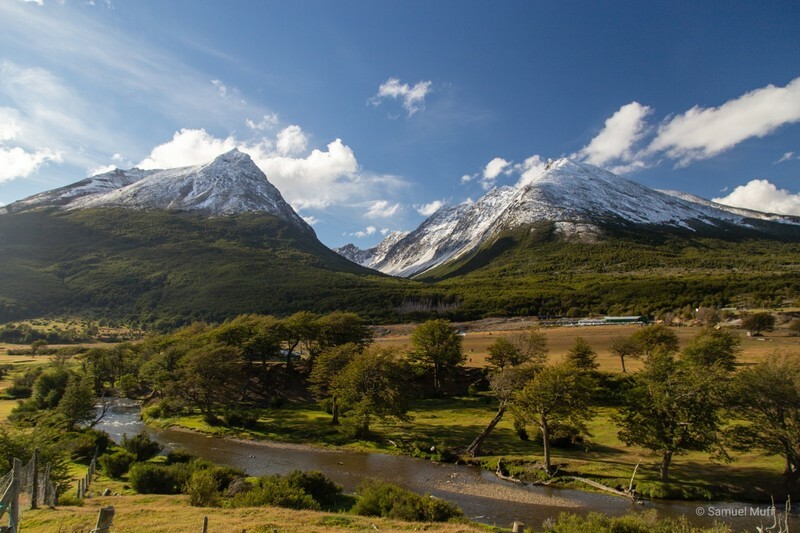 Moving South from Coyhaique, the scenery started to become really breath-taking. The mountains got higher, the valleys got deeper and the road got curvier. 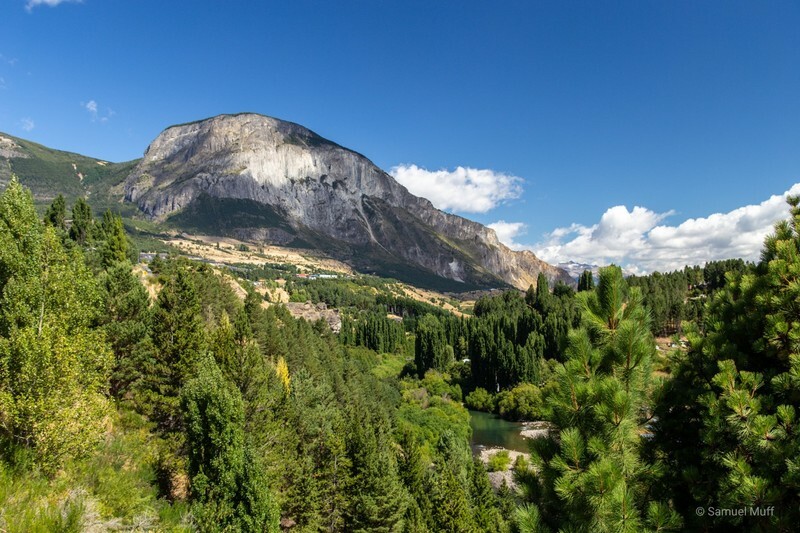 Our first stop was in Villa Cerro Castillo, a town named after the spectacular peak that can be seen from it. 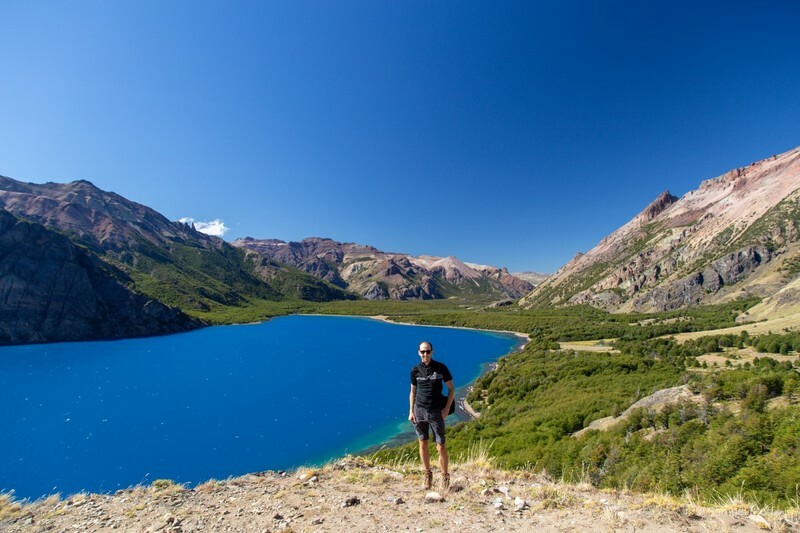 We hiked a steep path, about one vertical kilometer up, to a viewpoint from where Cerro Castillo could be seen even closer, with a blue lagoon in front of it. Not just the sight of the mountain was fantastic, but also the view of the untamed valleys, rivers and lakes below. 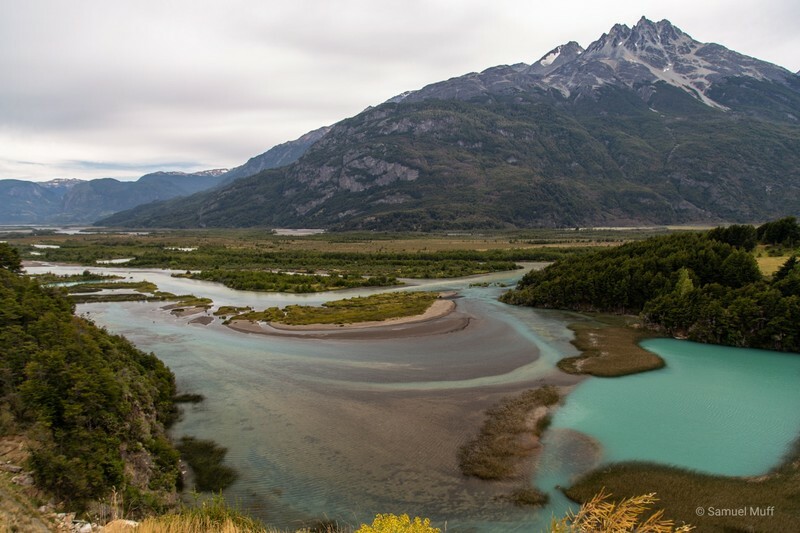 We were very positively surprised by the condition of the Carretera Austral so far. 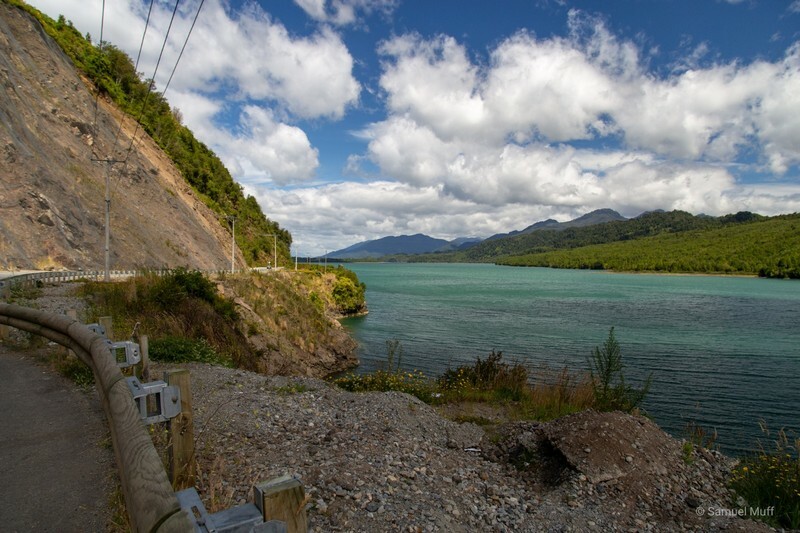 Between 80 and 90 percent of the road between Puerto Montt and Villa Cerro Castillo was paved. This was about to end now. South of Villa Cerro Castillo the highway is entirely unpaved. 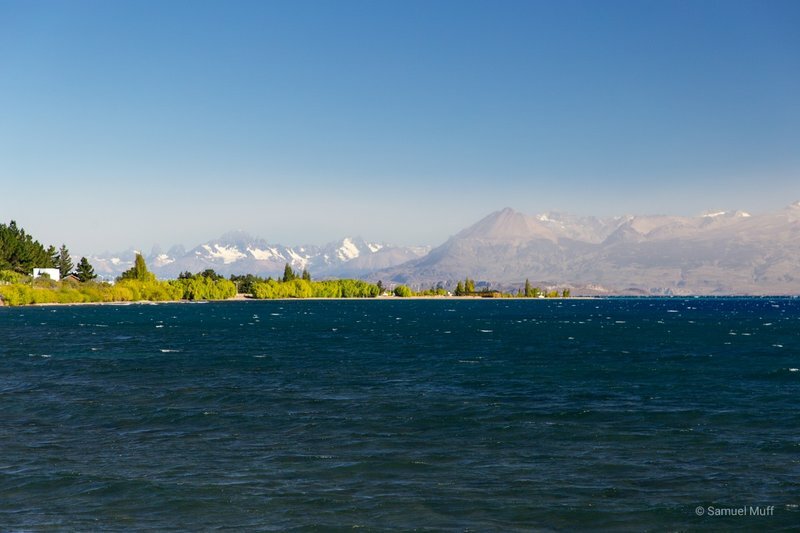 After zig-zagging through valleys for a while, the road reaches Lago General Carrera, South America’s second largest lake after Lake Titicaca. The next night we spent in Puerto Río Tranquilo, a small village at the lake, clearly unprepared for the amount of tourists that visit it. 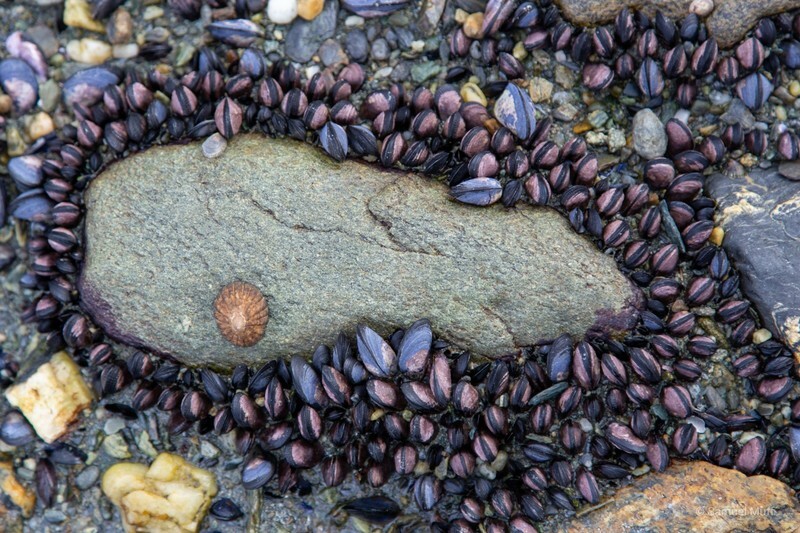 We tried at first to find a campground, but every place was so hopelessly overcrowded that we gave up on that idea. Locals were making a business of letting backpackers camp in their backyard and those backyards often already had 20 or more tents pitched back to back. 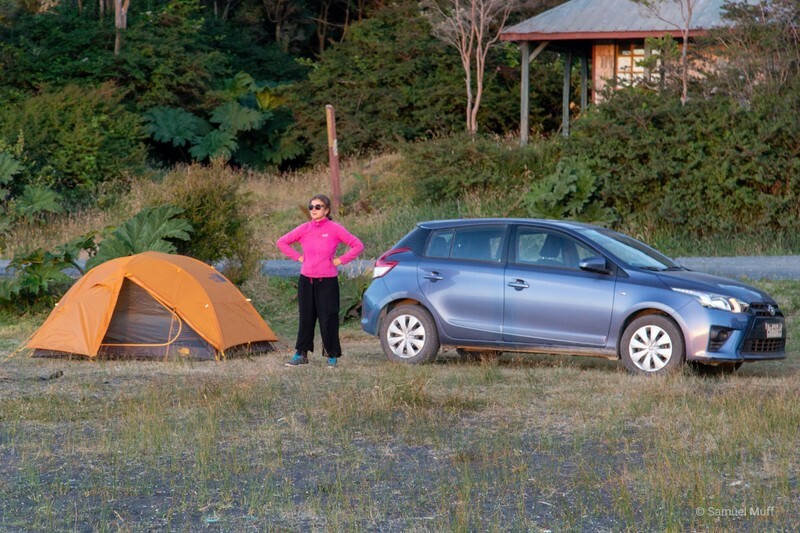 Not exactly our idea of camping as a way to be close to nature. After many unsuccessful requests, we eventually found a guesthouse that still had a room with a bunk bed left. 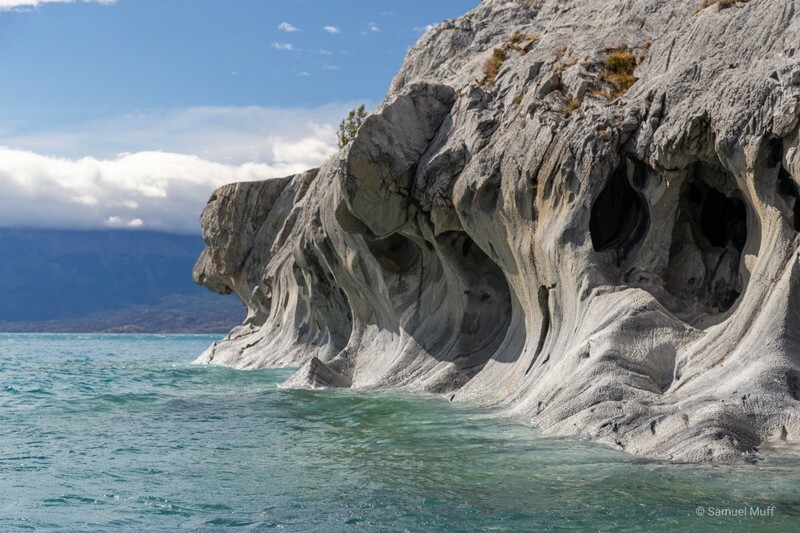 The reason so many people come to Puerto Río Tranquilo is the Marble Caves, which we visited on a boat tour. 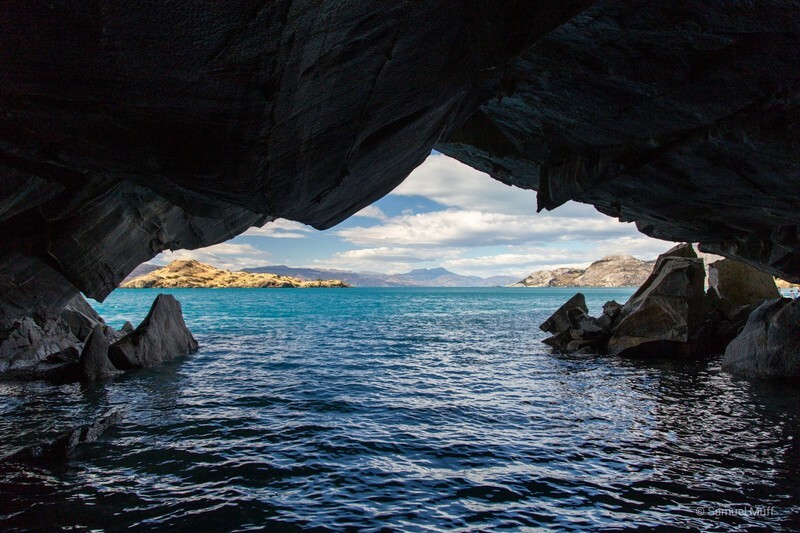 The caves have been formed by erosion from the lake over hundreds of years and are a stunning sight. 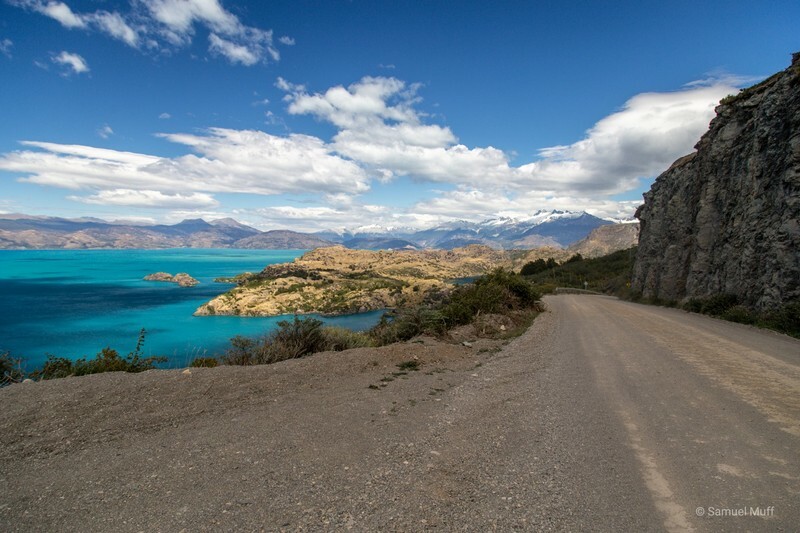 The Carretera Austral officially ends in Villa O’Higgins, but we saved ourselves the last 300 kilometers of it. 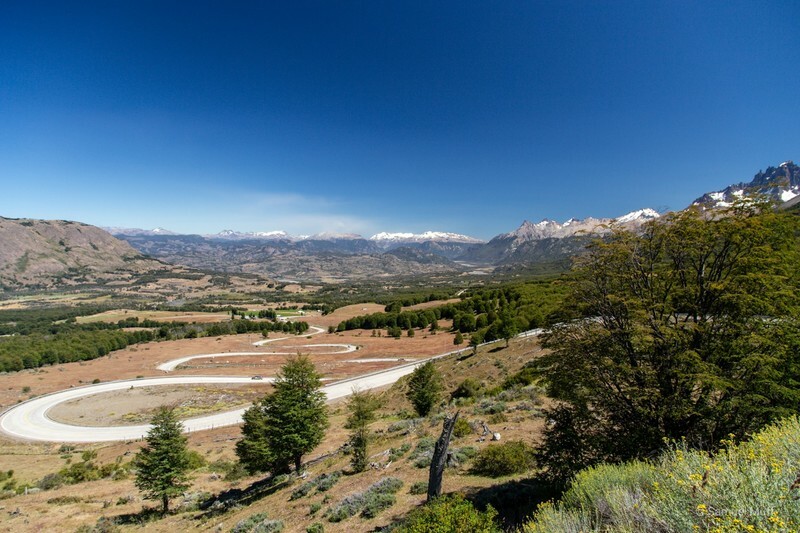 From Villa O’Higgins, there is no way of crossing into Argentina by car, so we would have had to drive the entire gravel road back up again. 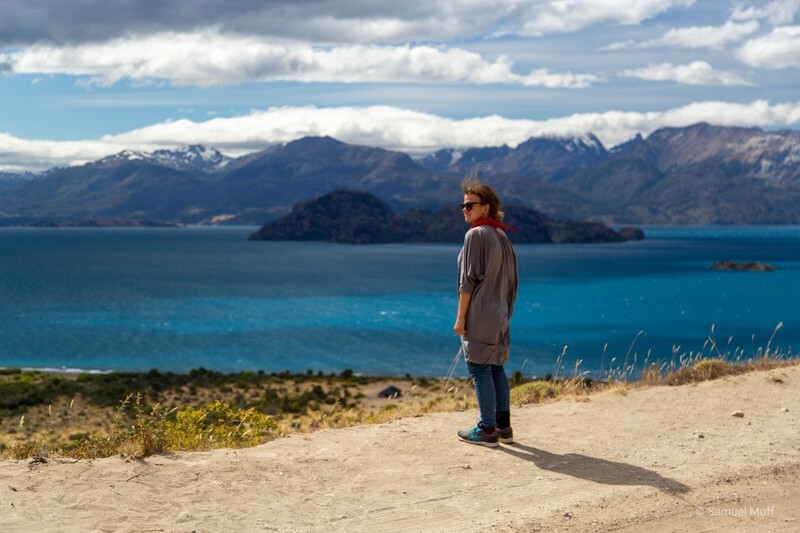 Therefore, after following the bumpy highway along the lake for a while, we took a turn towards Chile Chico, from where it is easy to cross into Argentina. The 115 kilometers to the small border town were sometimes difficult to drive, but very scenic. Almost the entire time we had views over Lago General Carrera from high above. 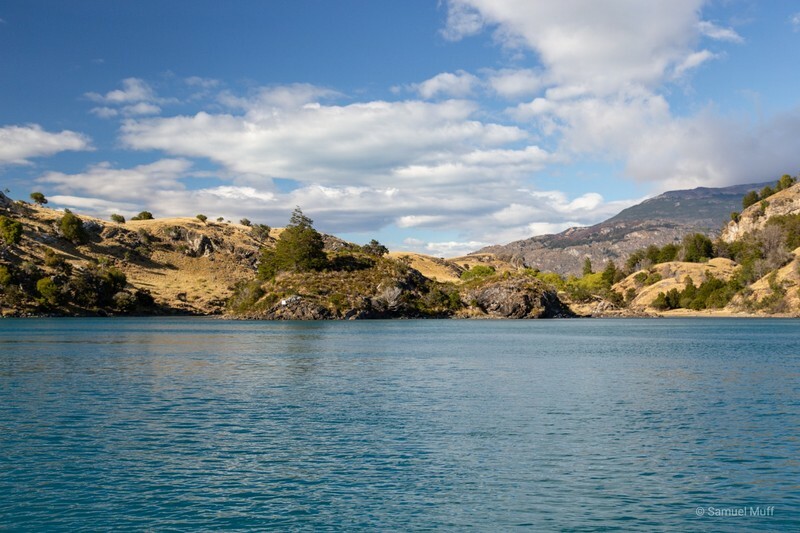 Before leaving Chile, we spent one day exploring Reserva Nacional Lago Jeinimeni, which is close to Chile Chico. Since the access road sounded too difficult for our small rental car, we hired a guide to bring us there in a 4 wheel drive. 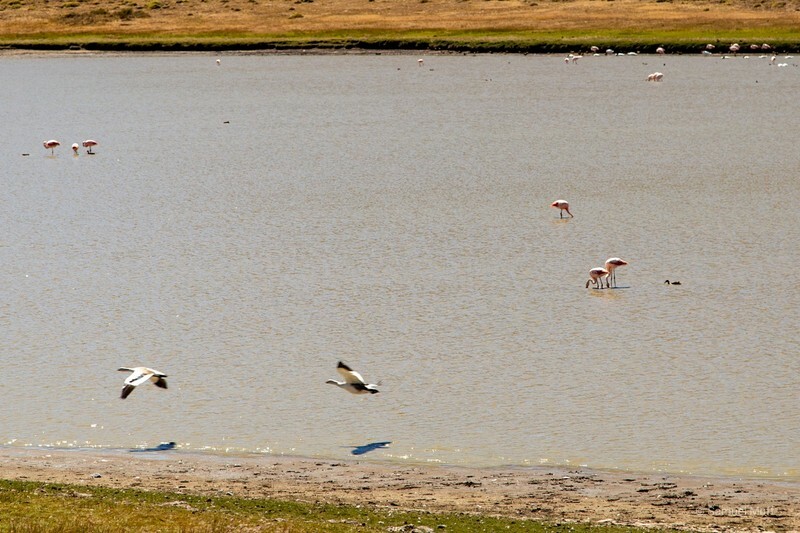 Along the way, we stopped at a lagoon that had hundreds of flamingos in it. It was very interesting to watch those exotic birds in the wild. Although we could see them with the naked eye, our guide also provided binoculars to watch them even closer. 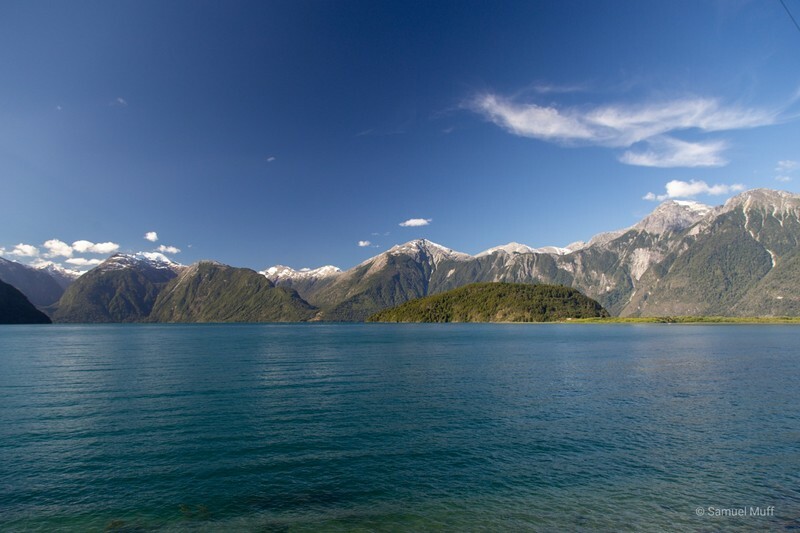 After that we arrived at Lago Jeinimeni and did a hike around the lake to a beautiful lookout. Probably due to the difficult road, there were very few other visitors there, which made our time at the stunning lake even more enjoyable. 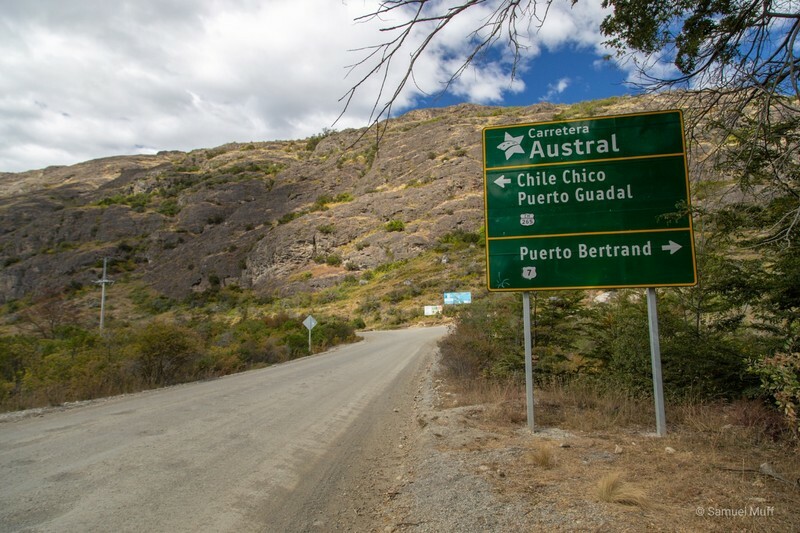 In the evening of the 15th of February, we drove to the border to leave Chile for Argentina. Interestingly, after hundreds of kilometers of unpaved roads, the last few kilometers to the border where very nicely paved. 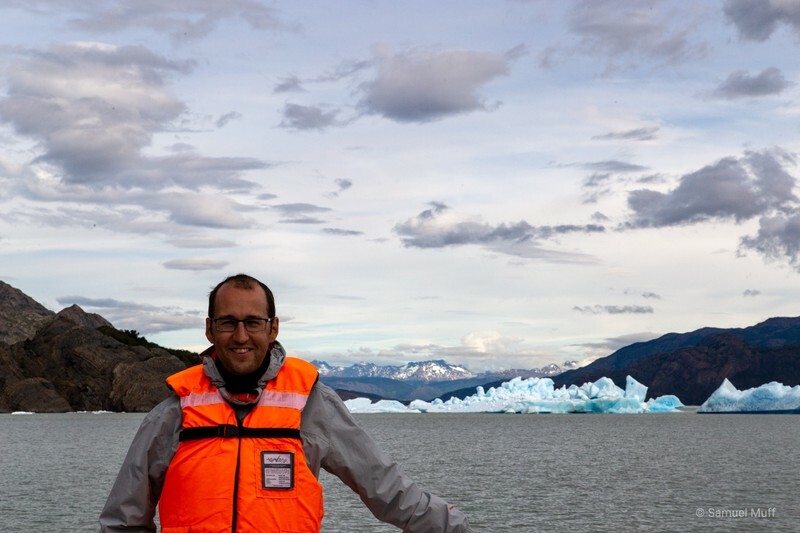 It almost seems like Chile wants to make a good impression on visitors entering from Argentina. 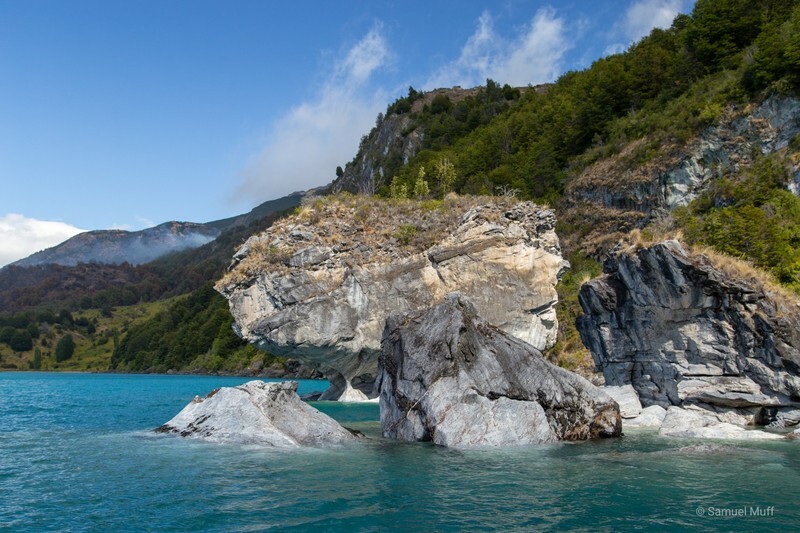 We started driving the Carretera Austral, known officially as Ruta 7 in Chile, from its start in Puerto Montt. 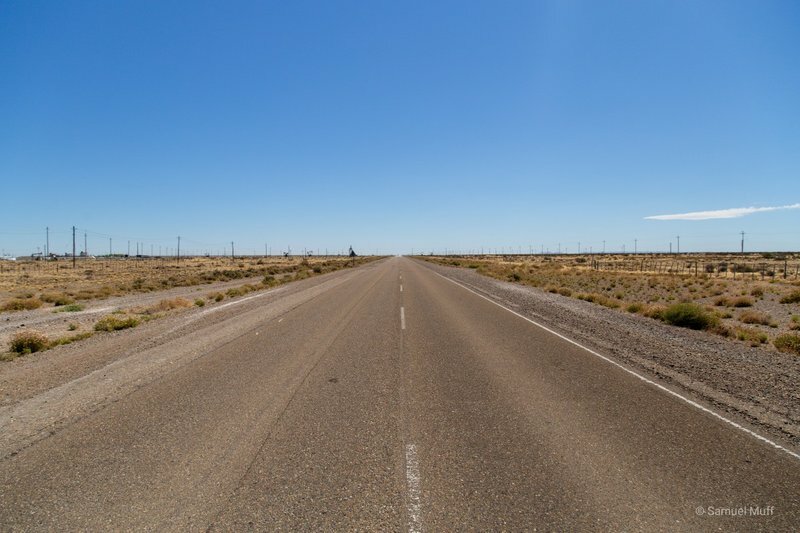 The highway was the brainchild of dictator Augusto Pinochet, who wanted to unite the nation by connecting even its most remote parts. 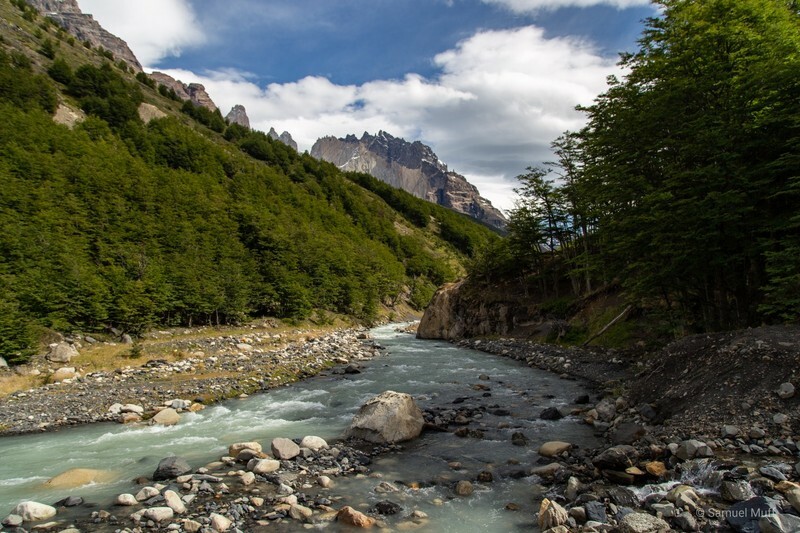 It cuts through the Aisén region, Chile’s most sparsely populated one. While originally just a gravel road, many parts have been paved now and paving is ongoing. Two sections near the start of the highway are interrupted by large fjords which require a car ferry crossing. The first crossing takes only 30 minutes and the ferries run regularly throughout the day. 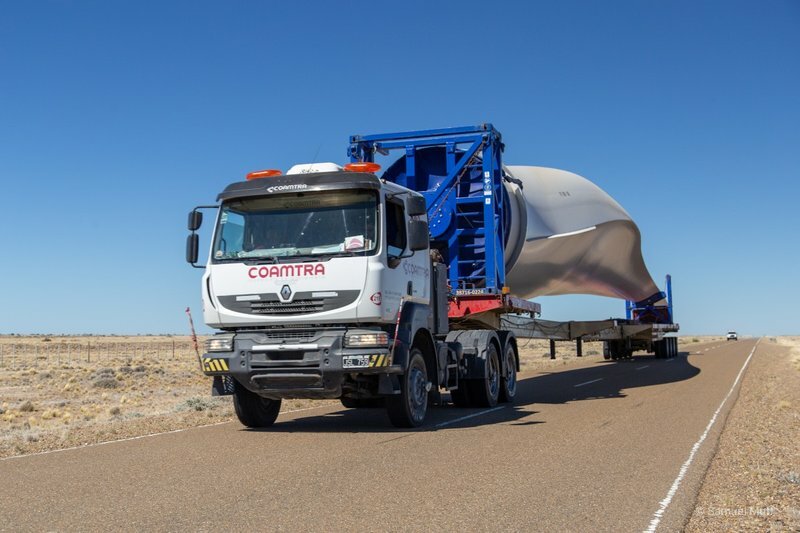 The second one, however, takes 4½ hours, runs only twice a day and requires a reservation about a week in advance. We procrastinated this reservation a bit too long and ended up having to go three days later than we would have liked to. 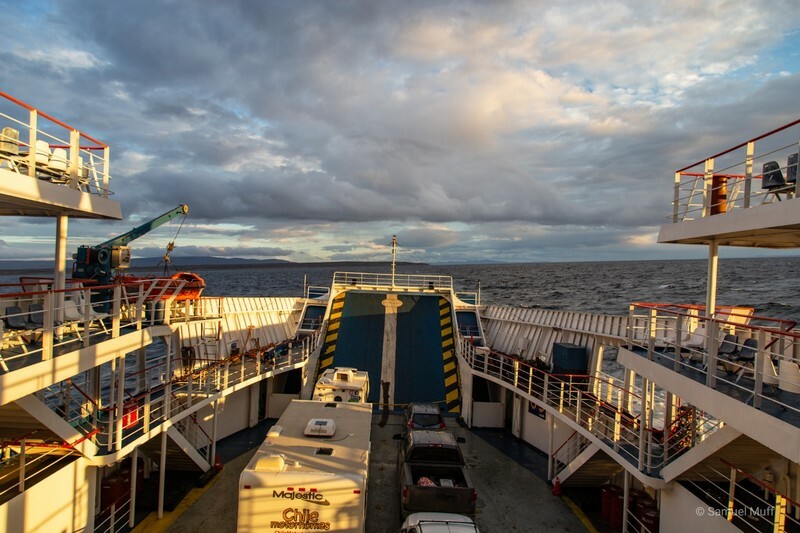 We spent two extra days in Chiloé, which were worthwhile, and two instead of one night in the sleepy town of Hornopirén from where the second ferry departs and where there is not much to do otherwise. 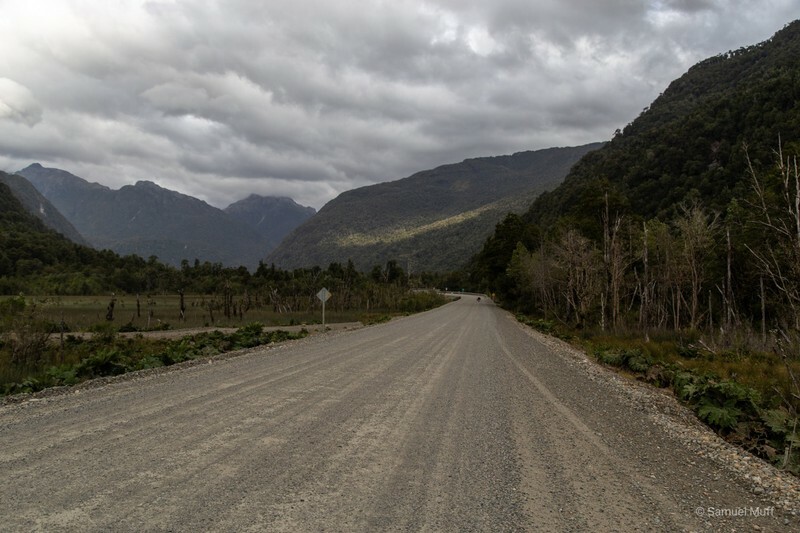 About half of the highway between the first ferry and Hornopirén was under construction, which meant that we had to wait for long times at stoplights and drive on rough dirt and gravel roads, a glimpse into the conditions we would encounter further south on the Carretera Austral. After the long ferry ride, the road was again unpaved for a while. 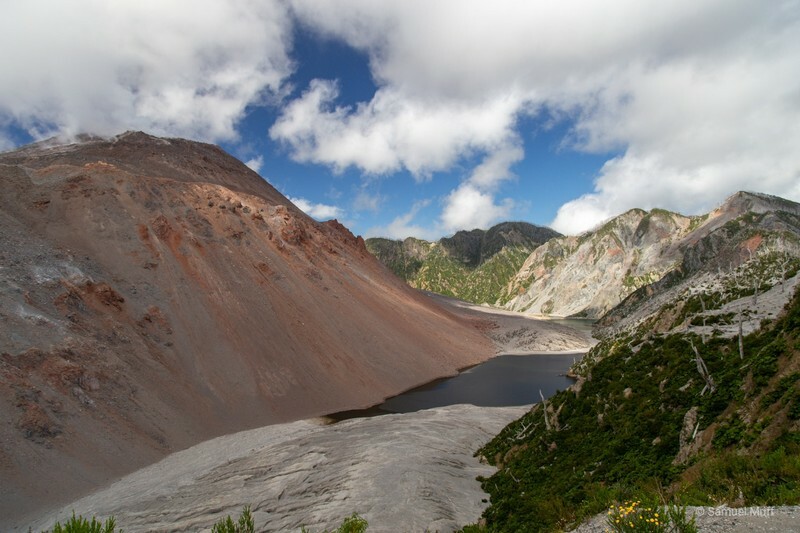 We tried to find a space in one of the official campsites around Volcán Chaitén, but were surprised the find all the decent spots already booked. Despite the difficulty accessing this region, it seemed a lot of people still went there. 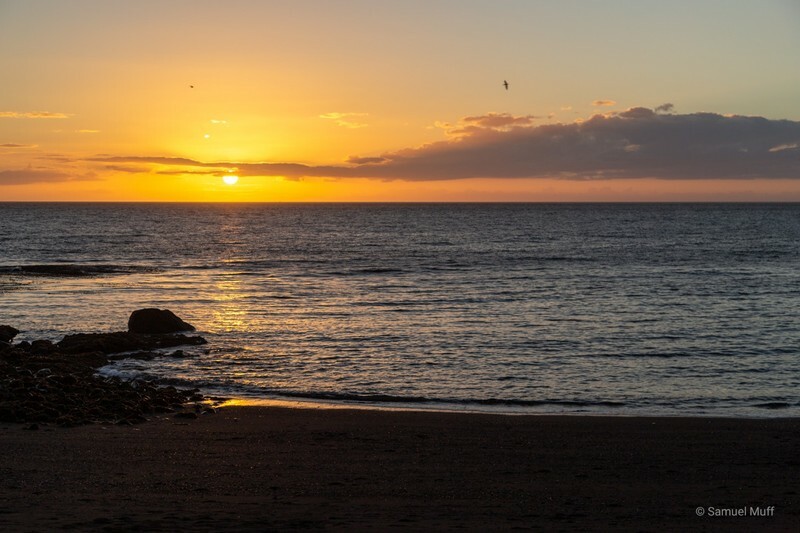 We finally decided for a wild camping location at the beach of the small hamlet Santa Barbara. 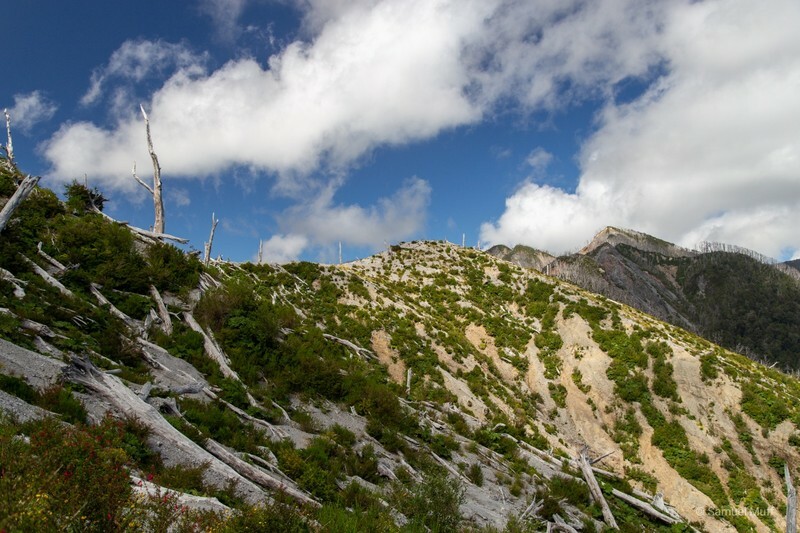 The next morning we hiked to Volcán Chaitén, an active volcano that last erupted in 2008. 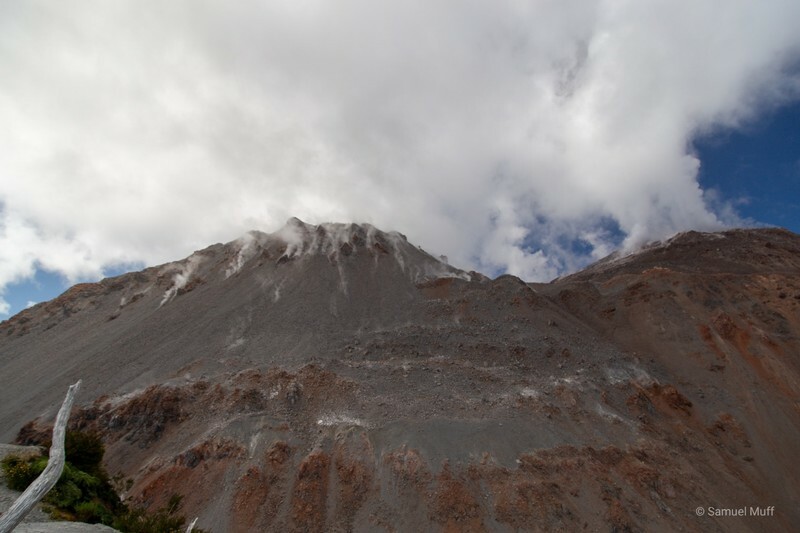 The day was quite cloudy but we could still see a lot of smoke coming out of the ground around the volcanoes peak. From Santa Barbara onwards, the highway was nicely paved and we were able to cover a lot of distance. Again, we were struggling a bit with finding a suitable campground for the night. 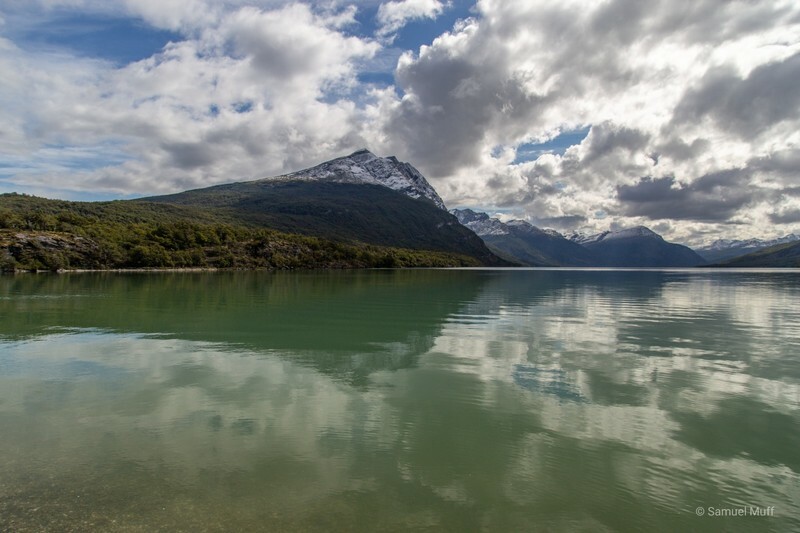 When we passed a nice looking fishing lodge near Lago Yelcho and asked if we can pitch our tent on their grounds, they offered us a room for a good price instead. Of course we took the offer and were happy to have a hot shower and a nutritious breakfast. The next day the road followed a nice river all the way to the town of La Junta where we spent the night in a small bungalow. Nights were getting colder now and we were glad to have a wood-fire oven near the bed. Our guidebook mentioned that the only interesting thing about La Junta is that they still have a statue of Pinochet on the Carretera Austral. 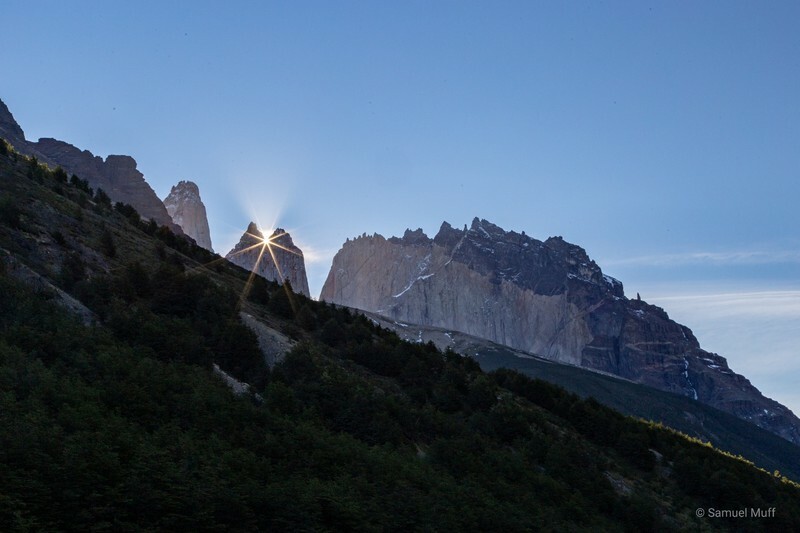 Some say people in the Aisén region have a rather positive view of the dictator, since he connected them to civilization. However, just on the day we were there, we saw workers take down the dictators monument, pack it in a large black garbage bag and paint over his name. 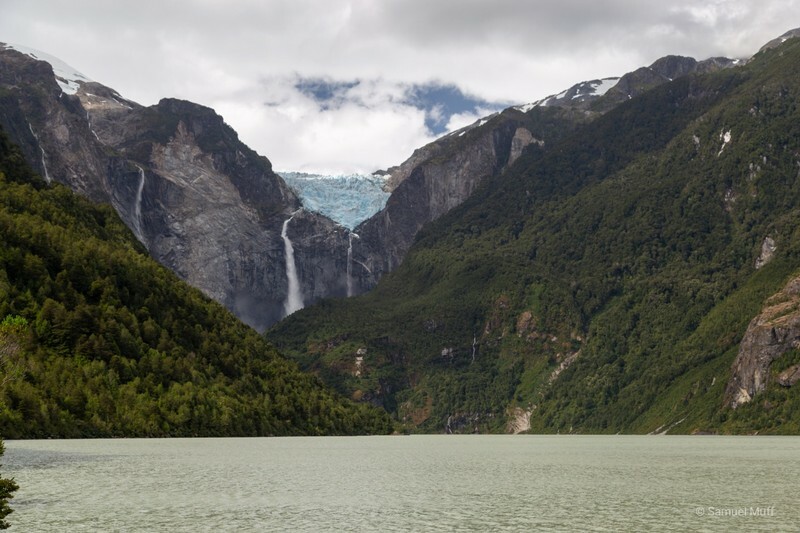 South of La Junta, we stopped for a while at Parque Nacional Queulat to see the Ventisquero hanging glacier and the large waterfalls emerging from its bottom. We spent another night in our tent a short stretch before Coyhaique. We were lucky to have a sheltered spot as there were strong winds and it was raining throughout most of the night. This would be our last night in the tent for a while, as temperatures continued to drop on the way South. 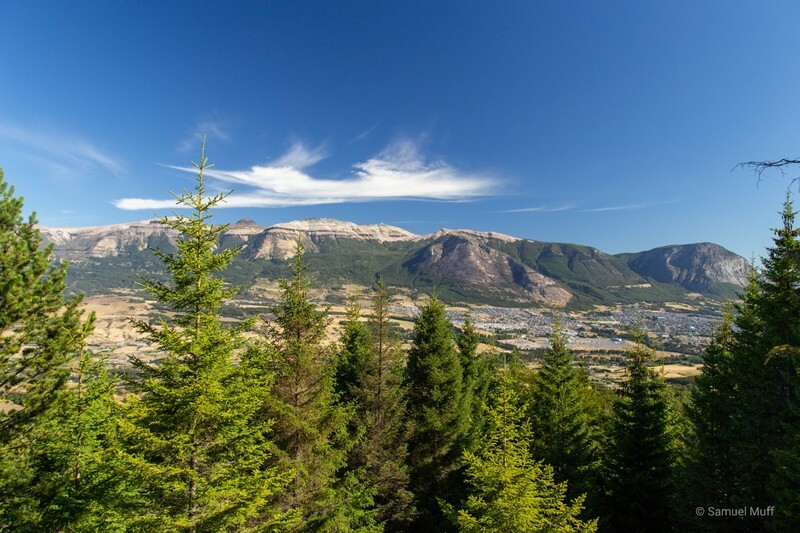 Coyhaique is the largest town in the Aisén region, with more than 50 thousand inhabitants. We spent two nights there and were able to stay with Paola, a friend from Marta’s studies. We used our time there to run some errands like getting a new hair cut for Sam and picking up our permits to cross to Argentina with our rental car. We also did a hike with Paola near the town, which is surrounded by beautiful nature.